Thanks to Richard A. Beranty author of the best P-38 article since Renita Foster's 'The Army's Greatest Invention' for allowing me to post his article on the P-38 webpage.. THE ENVIRONMENTALLY FRIENDLY CAN OPENER. WHEN THE POWER IS OUT OR YOUR ELECTRIC CAN OPENER BITES THE DUST A P-38 CAN SAVE THE DAY. 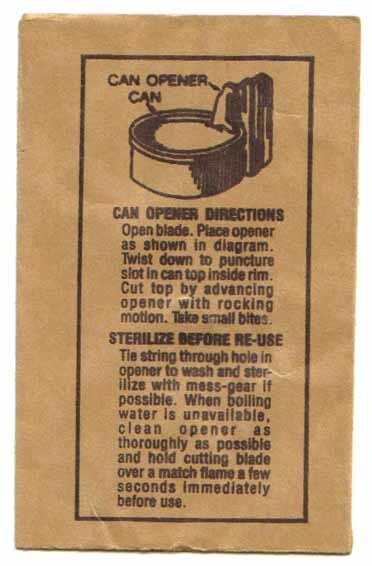 DON'T GET CAUGHT WITHOUT A WORKING CAN OPENER DURING THE ZOMBIE APOCALYPSE. A P-38 WILL WORK ON ANY SIZE CAN WITH A RIM. TAPE ONE TO EACH CAN IN YOUR GRAB & GO BAG OR EMERGENCY STOCKPILE. OR LOOK UP AT YOU WITH A BIG SMILE AND TELL YOU THEIR P-38 STORY. NOW WHY DIDN'T I THINK OF THAT!!! The P-38's Big Brother, twice as big and easier to use!! slot in can top inside rim. wrapper and still in good condition are getting much harder to find. 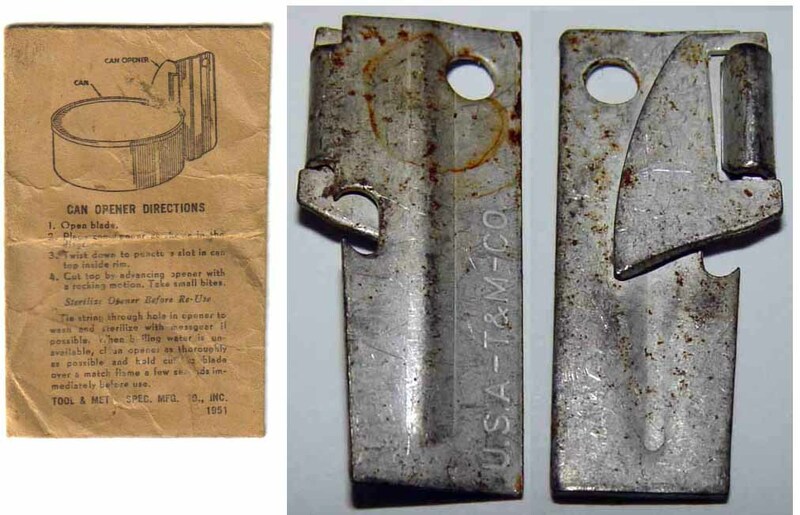 It's official designation is 'US ARMY POCKET CAN OPENER' or 'OPENER, CAN, HAND, FOLDING, TYPE I', but it is more commonly know by its nickname the P-38 which it supposedly acquired from the 38 Punctures required to open a C-Ration can. It is also known by many as a "John Wayne" by those in the Navy and Marines because he was shown opening a can of C-Rations using a P-38 in a WWII training film. From then on Sailors and Marines referred to them as a "John Wayne". Recently I received emails from two different Vets that referred to P-38s as 'Dead Dukes' after John Wayne's death. 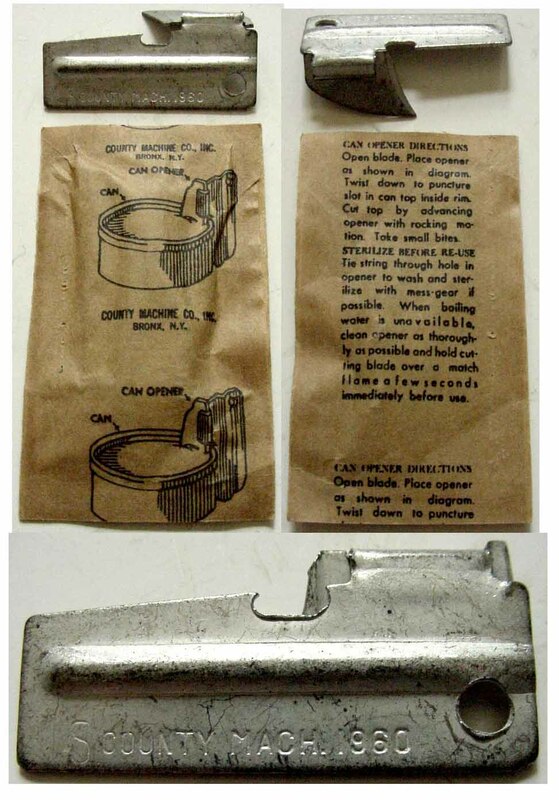 Originally P-38s came wrapped in brown Kraft paper packets with a diagram and directions how to use printed on it. About a dozen P-38s came packed in a case of C-Rations but because everyone was hoarding them eventually only 3 were included in a case (read Rations in Korea note). 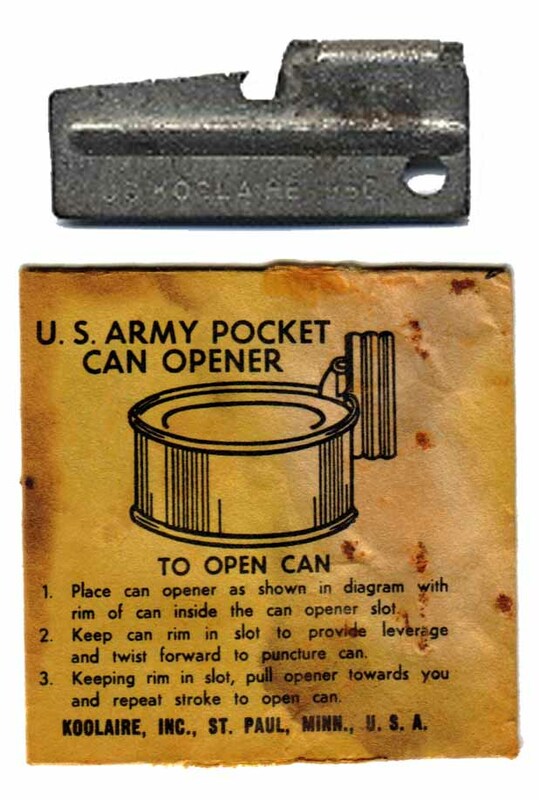 These handy gadgets have adorned the dog tag chains and key rings of WWII, Korean and Vietnam war vets ever since opening their first can of C-rats with one. I've heard stories about GIs holding C-Ration can opening races using P-38s which were usually won by one who could open a C-rat can in less time than it takes to read this sentence. Unopened vintage P-38s in their original paper wrapper are getting much harder to find so resist the temptation to open one if you find it. They are becoming collector's items since more and more GIs are putting them in their military & medal displays, collections and to replace a lost beloved P-38. Also P-38 collections have become very popular lately as they don't cost much and don't take up much space. It's a lot of fun finding the hard to get P-38s. I've had the same US SPEAKER P-38 on my key-ring since my first Boy Scout camping trip when the Scoutmaster gave it to me. We used them to open the big cans of peaches for the delicious cobbler that he would make in a huge cast iron skillet over the campfire. We ate that delicious cobbler as we sat around the campfire just before crawling into our sleeping bags. I can even taste it now. 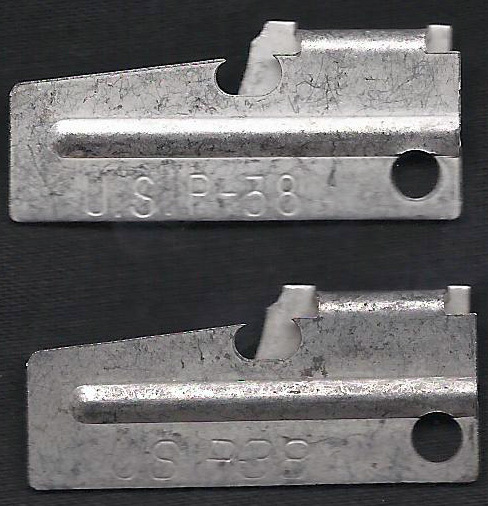 My Scoutmaster was a WWII and Korean War veteran that knew how handy the little P-38s were and gave one to every new member of the Scout troop on their first camping trip. Recently P-38s have added a new role to their long list of uses. Shelters and organizations that aid the homeless hand them out and they were also included in some of the humanitarian relief packets dropped into Afghanistan. I've also been told they are being handed out here in the USA by relief organizations after natural disasters for when the power is out and electric can openers no longer work. A P-38 is a lesson in simplicity at it's best. Don't you wish everything in life could be as simple and useful as a P-38. PHOTOS OF P-38s & P-51s THAT WILL GIVE YOU AN IDEA OF THE HISTORY & DEVELOPMENT OF THE ARMY'S GREATEST INVENTION. ORIGINAL WWII P-38s FROM GOVERNMENT CONTRACTORS BLOOMFIELD's, ANDROCK & J W SPEAKER. These are the earliest versions of P-38s that I can find and although they look identical to Korean and Vietnam war era and the modern versions of the P-38 there are distinct differences between them. 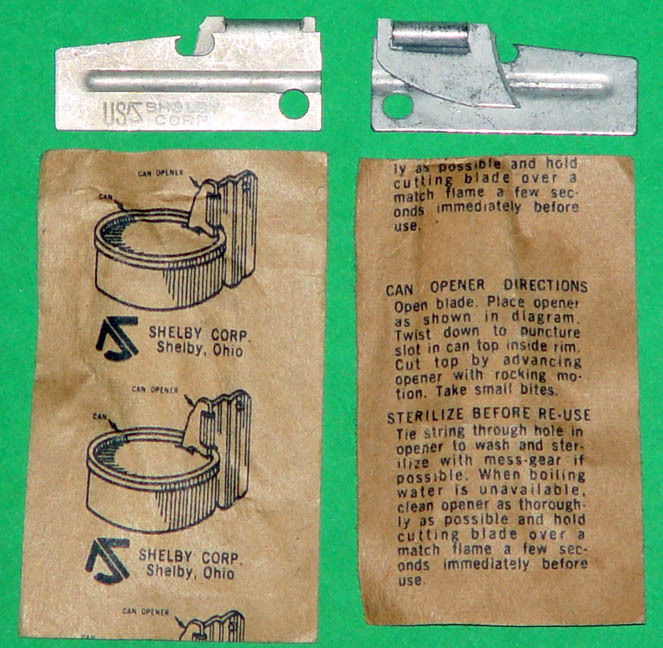 On the WWII versions only the very tip of the can cutting blade is sharpened through a grinding process rather than by stamping which is typical of later P-38s. 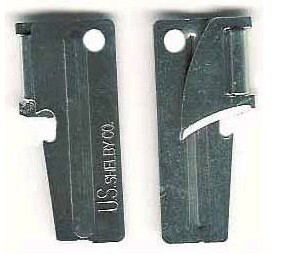 Another big difference is that on the Bloomfields there are no locking tabs to keep the blade open or closed so the can cutting blade just flops back and forth which must have caused many more cuts and torn pockets than the later versions. 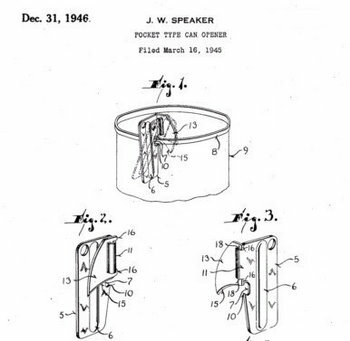 The Bloomfields and J W Speaker P-38s have a rib that runs along the entire length of the main body of the P-38 and while the Bloomfields have no manufacturer or year markings, the J W Speaker has "Speaker U.S.A. 43-44" stamped on the inside of the body of the P-38 rather than on the outside like every other P-38 I've ever seen. 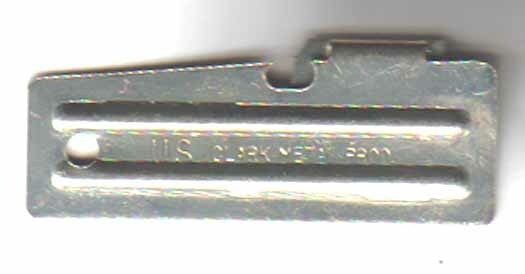 The Washburn P-38s do have the manufacturer's name (US ANDROCK) imprinted on them but no year marking. 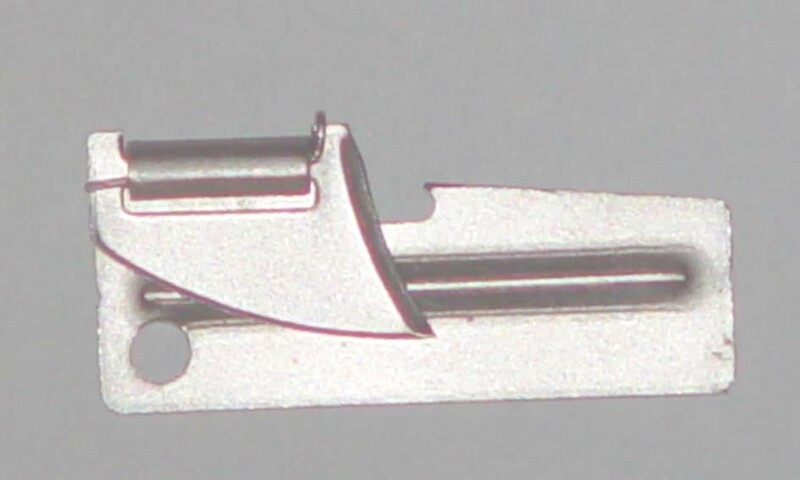 The rib on the main body of the Washburn P-38 also runs the entire length of the body but is slightly rounded at the very bottom. All these WWII P-38s are made from a slightly thinner metal and so feel just slightly lighter than the later versions. Other than these differences these WWII P-38s look identical to the modern P-38s and unless you knew what to look for you wouldn't be able to tell them apart. I was very happy to get them so I could add them to the website P-38 collection. Remarkably they were all still in their original paper wrappers. 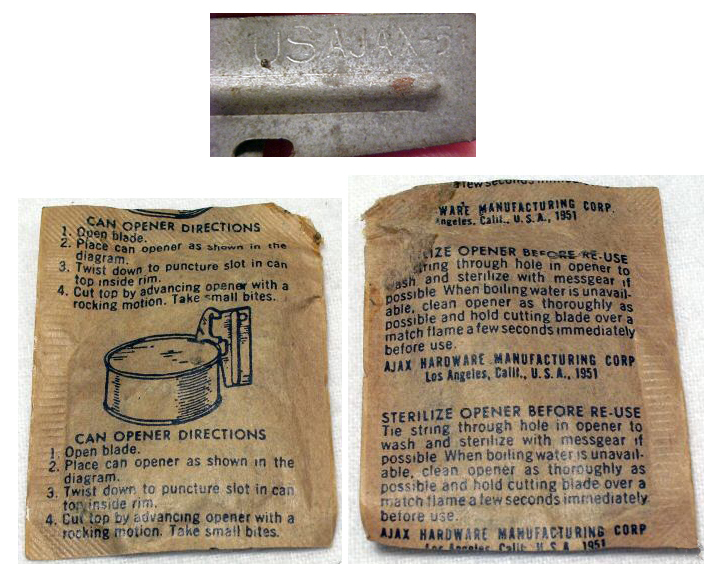 I believe this is a very early WWII Washburn because of it's construction and the way the instructions are printed. WWII J.W. Speaker Corp. and Essential Products Corp.
Speaker U.S.A. P-38s that come in a JW Speaker envelope and also in a wrapper that has Essential Products printed on it. and have Speaker U.S.A stamped on them. They are more refined than the 43-44 P-38s so they are probably later production. These are from a WWII Navy veteran's estate sale in Indiana. Just got this P-38 & wrapper. No year on it but I think it is a pre-1948 JW Speaker USA wrapper and the P-38 has Speaker U.S.A. on it. 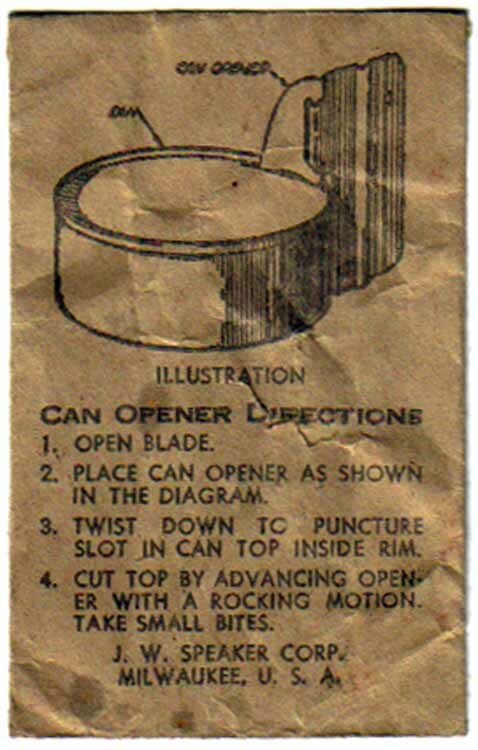 The way the Can Opener Direction are worded is another reason why I think it's pre-1948. 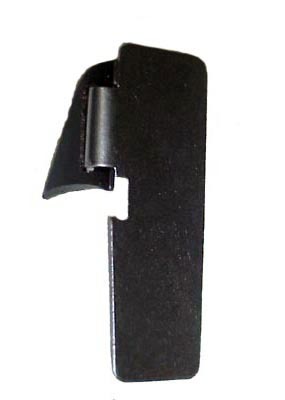 with locking tabs and the entire length of the can cutting blade is sharpened (although it still appears to be sharpened by a grinding process rather than by stamping). 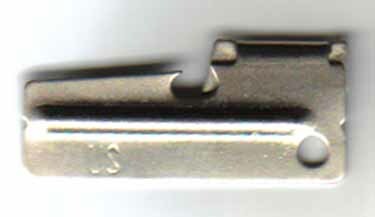 The rib on the main body of the P-38 has a rounded end well above the bottom of the main body of the P-38. It is also made of a thicker metal than the WWII versions. Except for the cutting blade grinding process the evolution of the design of the P-38 seems complete with this P-38. 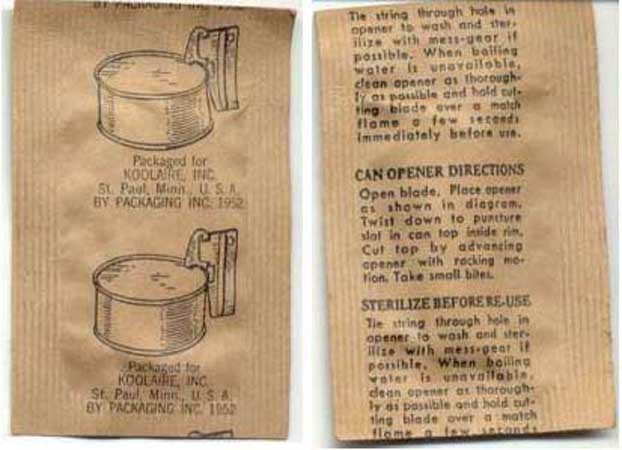 The paper wrapper is the same size as the WWII versions although the wording is changed and there is printing on the front and back of the wrapper. THIS LATE 1950 or EARLY 1951 US G.G. 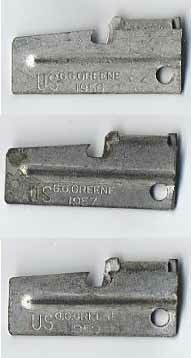 GREENE P-38 HAS THE FEATURES OF A MODERN P-38 WITH THE BACK RIB HAVING A ROUNDED ENDING ABOVE THE BOTTOM OF THE MAIN BODY, LOCKING TABS AND IS MADE OF A THICKER METAL BUT LIKE THE WWI VERSIONS THE CAN CUTTING BLADE TIP HAS BEEN SHARPENED ONLY ON THE END EXCEPT BY A STAMPING PROCESS RATHER THAN GRINDING. THE PAPER WRAPPER IS EVOLVING TO A LARGER SIZE ENVELOPE AND THE DIRECTIONS AND WORDING ARE WHAT WE SEE ON ALL THE LATER VERSIONS PAPER WRAPPERS. LATE 1950 OR EARLY 1951 US G G GREENE ? RAREST OF THE RARE P-38!! 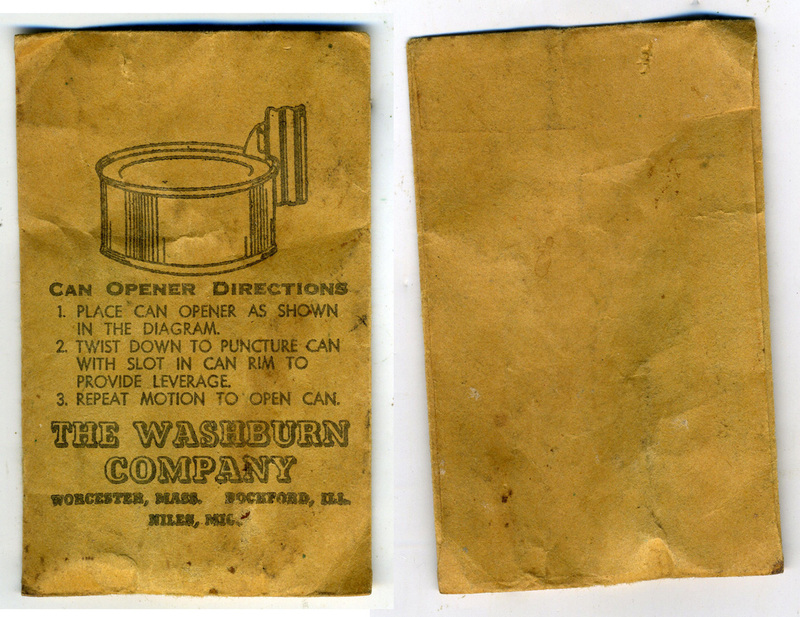 Other Washburns wrappers just have Rockford, ILL. on it but this one also has WORCHESTER, MASS and NILES, MICH. MARKING IN A 1952 WRAPPER. AND LEAVES THE CLEAR PLASTIC. TOOL & METAL SPEC. MFG. CO. INC.
WITH NO PUNCTUATION ON US !!! Someone sent me a History Channel P-38 and the little history card that was included with it that he received when he became a History Channel member. 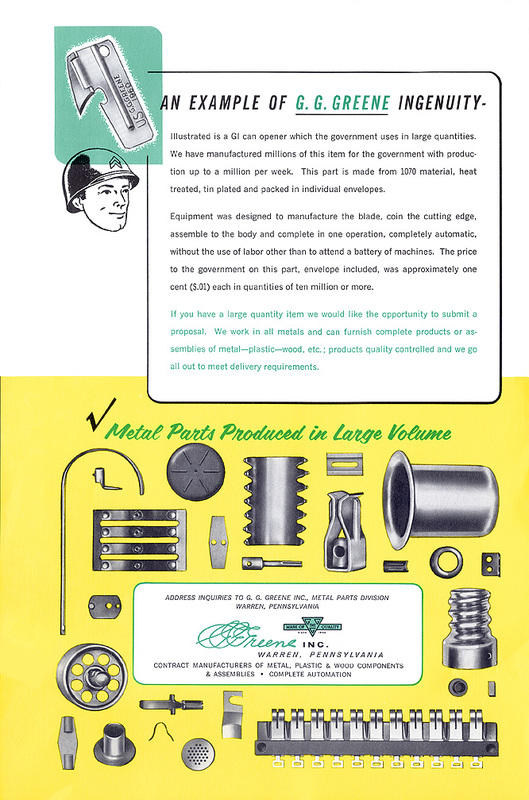 The P-38 was a US Speaker that had been chromed for some reason or other. Also they had a P-51 drawing on the history info card instead of a P-38. 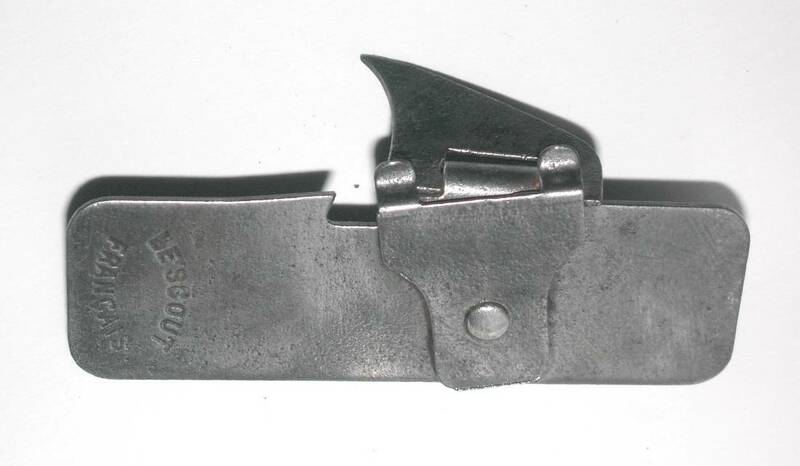 Below are a Swedish and Belgian P-38 type can opener. Both are just slightly smaller than a P-51 and very heavy. 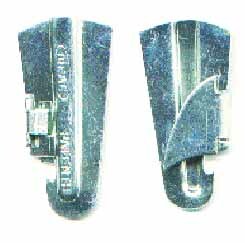 Above is an illustration of a P-51 size World War II German can opener stamped "Kamerad". 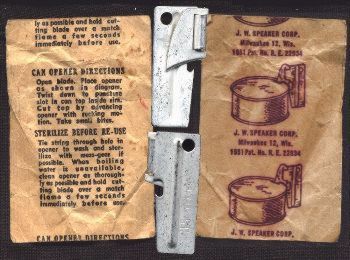 Spanish Army ration opener. As far as I know they are issued in all the rations (that I have come across so far), It's pretty well made and has a bottle opener and screwdriver included with it. THAT PEOPLE HAVE SENT ME. 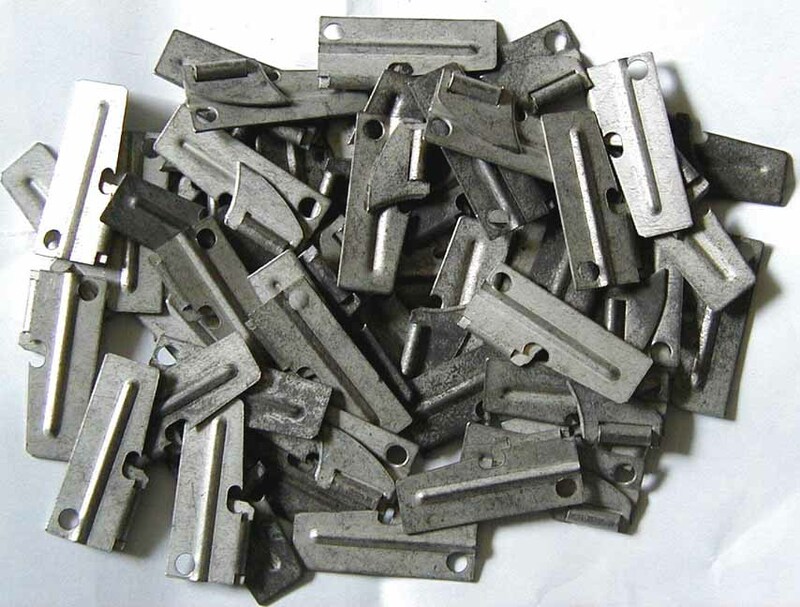 "THE ENVIRONMENTALLY FRIENDLY CAN OPENER"
The manufacturing of an environmental can opener (P-38) requires very little in the way of raw materials. 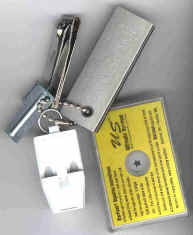 The environmental can opener is very small and light weight. It takes less big, smoky trucks to transport it from the factory. 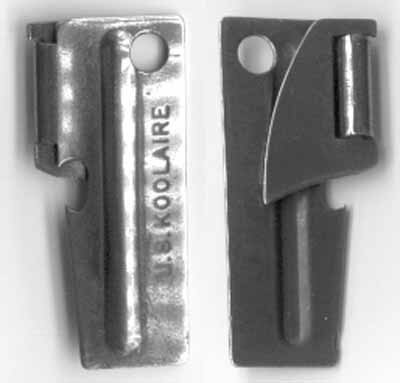 The environmental can opener almost never breaks or wears out, so the big, smoky trucks can leave the factory less often. The environmental can opener does not plug into the wall, it runs on people power, so it saves energy. 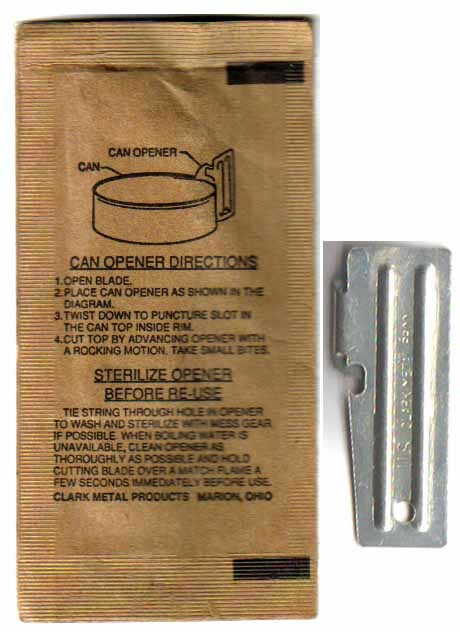 The environmental can opener does not come in a box, or have an owner? ?s manual, so it saves trees. Since the late 1970? 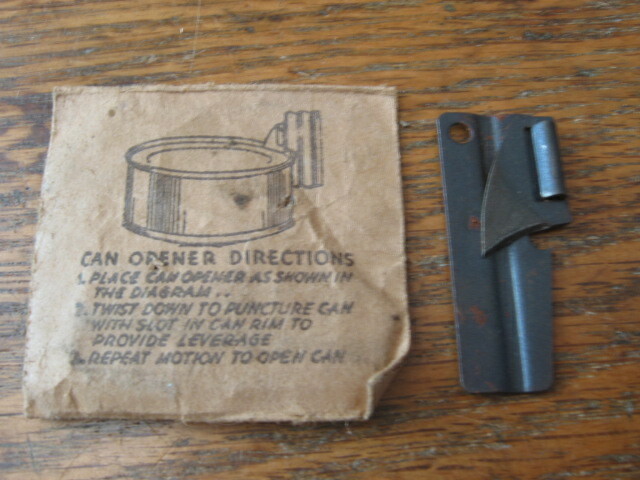 ?s, when I received one of these can openers from my Marine recruiter, I have owned no other can opener. Thank you for the Mail in Special. My P-38 was confiscated in court last month. I had had it on my keychain for over thirty years. Please send another. Hi, Jim. Mine's a G. G. Greene dated 1962. I took it from a box ofC-rations in 1963, on Okinawa. It went onto my dog-tag chain, and it is still with my tags. (I had a duplicate set of tags made, which I turned in when I got discharged). Every time I look at the tags or the P-38, I can time-travel. The most interesting stuff that we loosed with our P-38'swas the canned crackers, which we would takeout and pre-fractureby hitting them with our .45's, rather than trying to bite them. 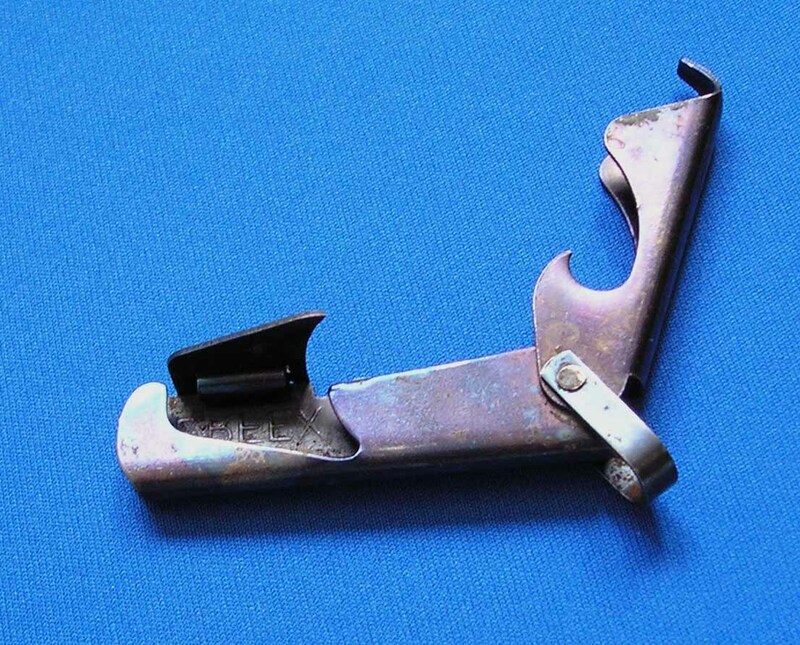 Anyway, the P-38 was the takedown tool for our M2 Carbines, which always began with loosening the band screw and ended with re-tightening it, and it was perfect for levering straight the cotter pins in various firing devices. I should add that, when I got out of the army and discovered that P38's weren't commonly available in the civilian world, I would buy them at gun shows almost compulsively - as if life would not be right if I or my relatives didn't have an adequate number of P38's lying around. 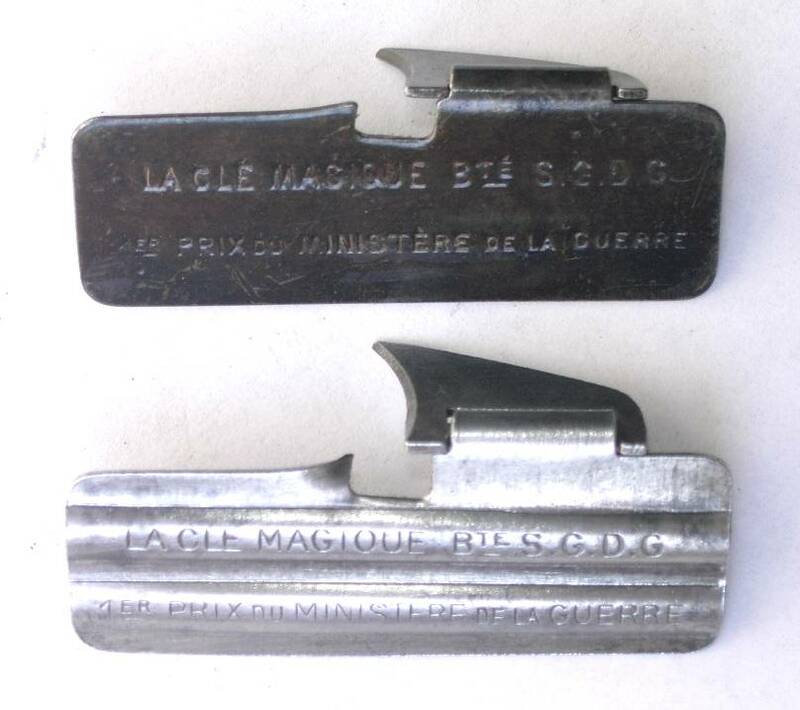 Somehow, to a couple of generations of servicemen, these things became the most endearing little pieces of metal, ever. the rest of it's life with distinction in the USAF Military Police and civilian life. It will be missed. 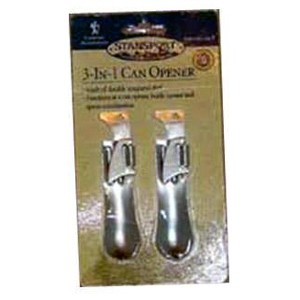 I occasionally travel and lately have taken to giving away p38 can openers. (They make great conversation starters although it seems only men over 40 years old actually know what they are). On a recent flight I gave one to the woman sitting next to me. The flight was cancelled and we all headed back to the ticket counter to reschedule our flights. As luck would have it, we are sitting next to each other on the rescheduled flight. 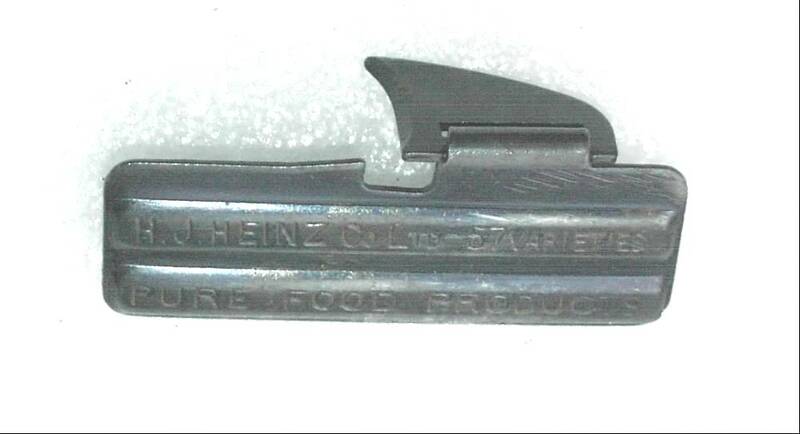 Thing is, her p38 can opener had been confiscated by security! The 6 or 7 p38 can openers I had in my carry-on were not even noticed. Of course I gave her another one. DON'T TAKE YOUR P-38 TO AN AIRPORT, IT MAY GET CONFISCATED! Unfortunately, I have a bad news story to tell and warn others about. I was just on a business trip from BWI airport in Baltimore to Tucson, AZ on business and had my P-38 confiscated off of my keyring by airport personnel. This was my father's P-38 from 1952 that he had in Korea. I was upset to say the least since I traveled in January this year and had no problems with keeping it. Bottom line: Don't take it to the airport, leave it at home if you want to keep yours. AIRPORT CONFISCATION STORY FROM THE DETROIT NEWS! THE ARMY gave Ron Hingst a P-38 when he was 19 years old, and he carried it faithfully for 35 years, through good times and bad times and lots of airports. A security guard at Newark International snatched it away this month, and now there's an empty place in the Howell man's heart. Also, his key ring is lighter. Hingst's P-38 was not the Walther pistol of the same name, or for that matter the P-38 Lightning fighter plane from World War II. 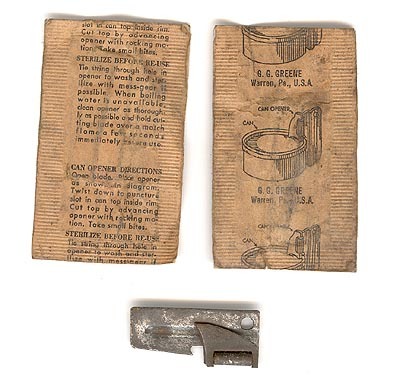 It was a can opener -- a 1 1/2-inch-tall piece of metal with a small, hinged triangular beak that folded out to puncture lids. The Army developed the P-38 in all of 30 days in 1942. Many consider it the military's greatest invention. It doesn't break, rust or dull, and until C-rations were replaced by Meals, Ready to Eat, the P-38 was a soldier's invitation to dinner. 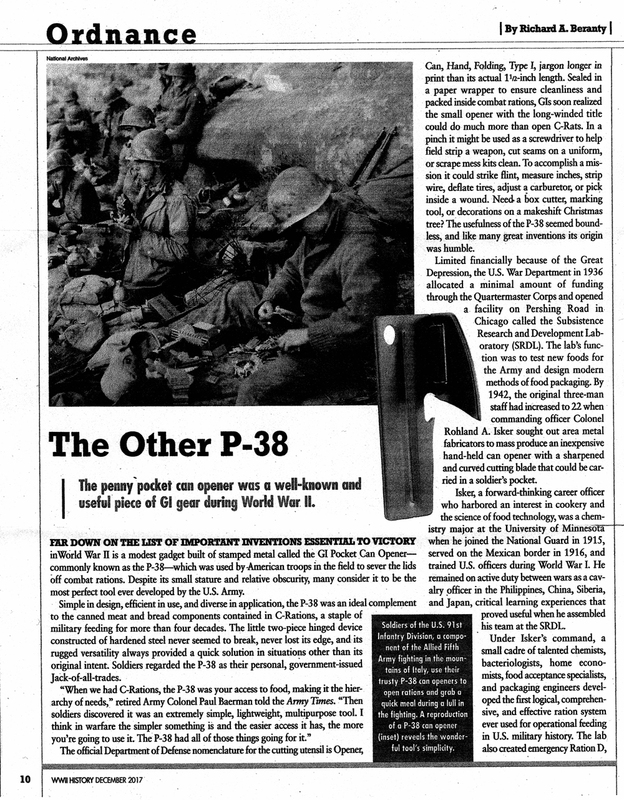 As two generations of veterans can tell you, the P-38 was also a first-rate screwdriver, boot cleaner, letter opener, carburetor repair tool and anything else you needed it to be. But today, apparently, it's dangerous and obsolete. Hingst, 54, flies at least once a month. A few weeks ago, he and his P-38 set off to Quebec City to play hockey. 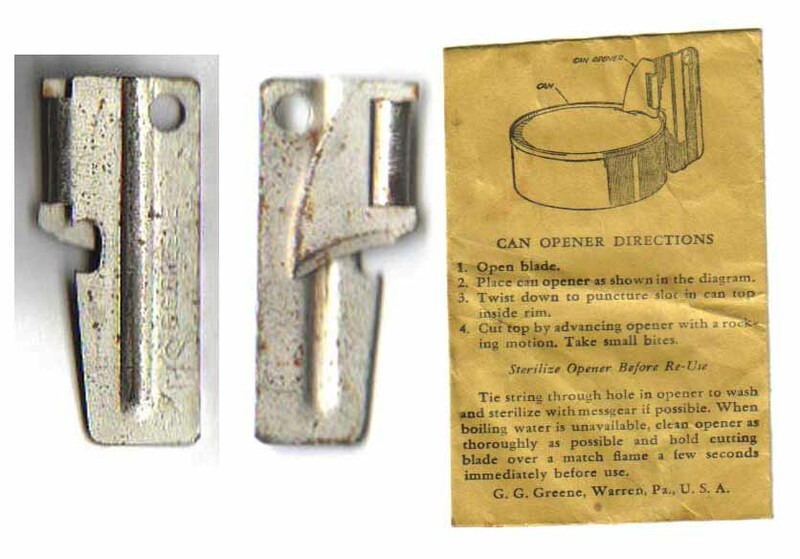 He went from Detroit to Boston and Boston to Newark, and his can opener passed muster twice. Then, on the final leg of the trip, a guard stopped him. "You got to give me that," the man said. "C'mon," Hingst protested. But the clock was ticking, the line behind him was only growing longer, "and what could I do? I'm going to argue about my can opener?" Coming home through Boston a few days later, Hingst saw a uniformed National Guardsman and decided to get himself some sympathy. "Can you believe I had my P-38 confiscated?" Hingst said. "Well, it should have been," said the Guardsman. "The 38 is a sidearm." Hingst thus discovered that the P-38 is no longer standard issue. So he still doesn't have his can opener, and now he feels old. DON'T TRY TO TAKE YOUR P-38 ON A PLANE IN DENVER! I read the story from Ron Hingst. I know how he feels! I was "relieved" of my can opener by the airport security, too. I was not in the armed forces, but my father, who is a Brigadier General, was in the Army for 44 years. When I was 12 years old, we lived at Ft Polk, Louisiana during the Berlin Crisis/Cuban Missile Crisis. 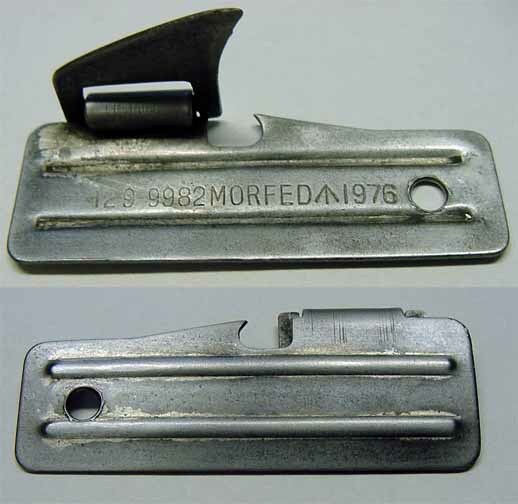 On Armed Forces Day 1962, I was given a P-38 can opener....and I LOVED it. I have kept it closely guarded for 42 years! I have flow to NYC, LA, Atlanta, Houston, Dallas, San Antonio, Milwaukee, Madison, New Orleans, Casper, Billings, Newark, Miami, Orlando, Shreveport, Chicago, Cincinnati, Las Vegas, San Francisco even to Mexico and Germany with that can opener in my purse. NO ONE HAS EVER QUESTIONED MY INTENSIONS! I went to Aspen, CO earlier this month and to my dismay the Gestapo at the Denver airport took it! I did not even have it on my key ring! They had to DIG in my zipped & snapped coin purse. What did they think I was going to do with it? My keys are a much more lethal weapon, even hot coffee would be more deadly! (IF I WAS DUMB ENOUGH TO DO SOMETHING to someone on a plane!) That P-38 was a part of me.......part of my proud history as an "Army brat". I am angry and saddened at the loss. And I DID MISS my plane, because these people were so completely unreasonable. While the spent time harassing me, REAL terrorist were probably allowed to go through with no problem! Now I am glad to see that I can get another P-38 from Georgia Outfitters. I think I will order 25 and give them as Christmas gifts (with caution notes attached). My P-38 was also confiscated at the airport in Bloomington, Illinois. I've flown all over the world with that P-38 on my keyring never thinking twice about using it as a deadly weapon. Even when I explained that I could do more damage with the keys on my ring, the keys were not confiscated, only the P-38. My husband bought me a new one but it's not the same. It's almost as if they took a piece of me away from me. I sure wish I had seen your site before that terrible trip. Next year will be 30 years that I have been carrying the same P-38 ? ?John Wayne??. Mine is a Shelby that came from a C-rat box on Pohakuloa, Big Island of Hawaii while with Battery A, 1st Bn, 12th Marines. At any rate I got one, put it on my tags and now it? ?s on my key ring. In 25 years, I have been stationed with the 10th Marines, 12th Marines, 8th and briefly the 6th Marines as well as a few 2nd and 3rd FSSG Battalions (8th Comm Bn, and Charlie Med. , Camp Hansen Okinawa). My trusty P-38 has been with during the whole time. A while back, someone borrowed my keys to open a can of coffee. They were late bringing the keys back, but I wasn? ?t so worried about my house or car keys, my P-38 was on that ring and I worried that someone would take it off the ring and I would never see it again, and several jokes were made about me to that effect. As others have said, if they lose it, a piece of them disappears with it. I guess if we treasure it that much, it should be in a safe deposit box, but I would feel naked without it. Here's my story. I acquired my P-38 roughly two years prior to joining the world's finest Navy. I have it on my key chain right now. When my father, a former army puke, first saw it, he relayed to me many stories of how useful to him it was while in the field. We have been around the world together, my P-38 and I. I have used it during many evolutions on board various ships: General Quarters, Underway Replenishments, Vertical Replenishments, Sea and Anchor Detail and many, many watches that I stood. It was taken it into the heart of the White Sands Missile Range while we built sites to be blown up by various missiles and bombs. It has been to Japan, Korea, Singapore, Australia, Africa, Hong Kong, China, Malaysia, Mexico and many wonderful states here in America. I have shared it's wonderful simplicity with family, friends and sailors. 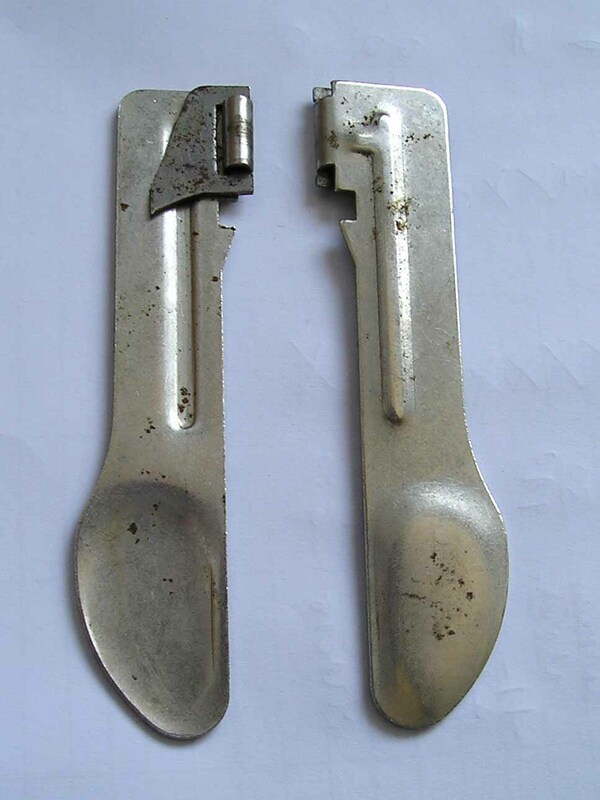 I have used it to open coffee cans, smoked oyster cans, soda cans, tuna cans, salmon cans. I have used it to cut plastic, paper, string and rope (that took a lot of patience). It's versatility and ease in storage has made it a wonderful tool. A group of guys in my division are getting an order together as I type this. My son is now in Boy Scouts. He will be receiving my P-38 as my older hands require me to move up to a P-51. I am willing to bet that my JW will be passed on to his son as well. As a passenger screener, an older vet came thru my checkpoint, he set off the metal detector so off he went to secondary screening. I was the screener and told him to empty his pockets, of which was his P38 which set off the detector. I asked him where he got it, and the told me he was a WWII vet and had it for many years. I mentioned that I had one very similar when I served in Vietnam. I saw no value in confiscating it and told him to put it back in his pocket and move along. Less then 3 inches i believe is acceptable for sharp objects by the way. This Memorial Day will be the largest gathering of WWII vets for the grand opening of the WWII Memorial in DC. I always keep an eye out for vets and actives alike, and go out of my way to assist them. When I was a kid in the Scouts in the 70's in southern Mississippi, a P-38 was unofficially a required piece of equipment. 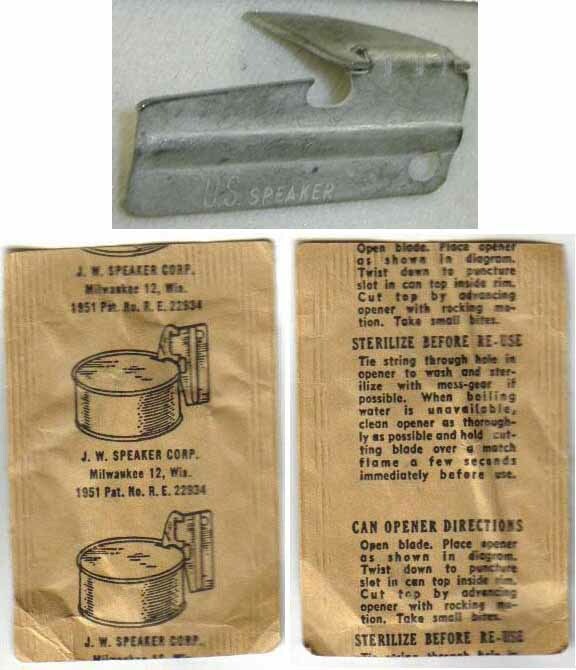 Not only could you find them in Military Surplus stores and outdoor supply stores the Scout main council shop would always have them on hand for a quarter a piece. Plus they had them for sale in just about every Scout Camp commissary that I visited in the entire state. 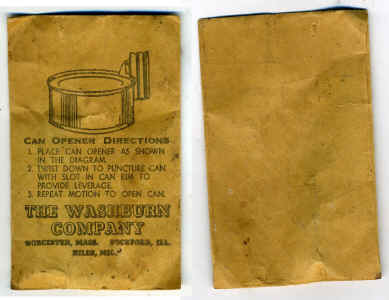 We would even have competitions in the troop to see who could open a can the fastest when we were on a weekend campout. I work as a Veterans representative with my office in a local National Guard Armory. They were getting ready to deploy to the Mid East and I pulled out my keychain with my P38. After using it to take out a screw and cutting some 100mph tape a young Sgt asked, "What's that thing?" I replied, "A P38" His reply was What's a P38?" I knew then that I was in the old soldier category. His indispensable P-38 went to his grave with him. My name is Joshua Nelson. And I have a little story for you. During my childhood years I spent most of my time with my grandfather, a man I highly respect even in passing. Edward Hyland, or simply Paw-Paw to the grandkids, was full of stories and life experience and handed them out only in small doses. Pretty much a quiet man but when he talked everyone listened. Paw-Paw carried very few things about him but a few were as indispensable as his wallet and keys. He carried a solid old Buck knife, a weathered Zippo that was a bowling league trophy, and his P-38. 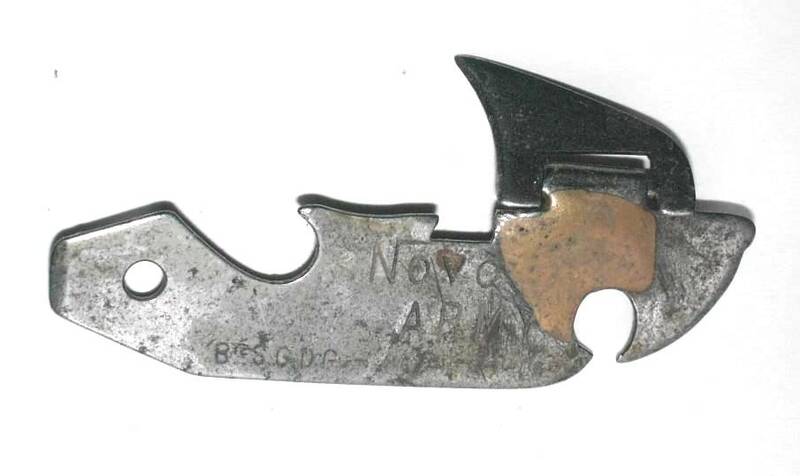 As the years past the Buck, the Zippo, and the P-38 were never replaced and never forgotten. The P-38 always struck my brother and I as bit a strange but we couldn't deny the simple uses it had. So of course, being young, it became a magic wand of sorts. The brakes on your bicycle need adjusting? The P-38 to the rescue! Small bit of string on your pants? The P-38 to the rescue. That little "magic wand" did everything from removing small pebbles from shoes to cutting the plastic bands around Christmas toys. I won't say the P-38 ever saved my life but it certainly helped a quite a bit. Now the famous story that my grandfather attributes to his P-38 was his uses of it during surveillance missions over Southern China. He was a photographer and his mission was to recon the seas around Japan for any suspicious activity. Supposedly the camera equipment that he used required special tools remove it from the mounting. Being in a rattling aircraft the camera would break down continuously and due to the same rattling he would always lose screwdrivers. But since the little "P-38" was always around his neck, he never worried. My grandfather has since passed away and I inherited his pockets so to speak. 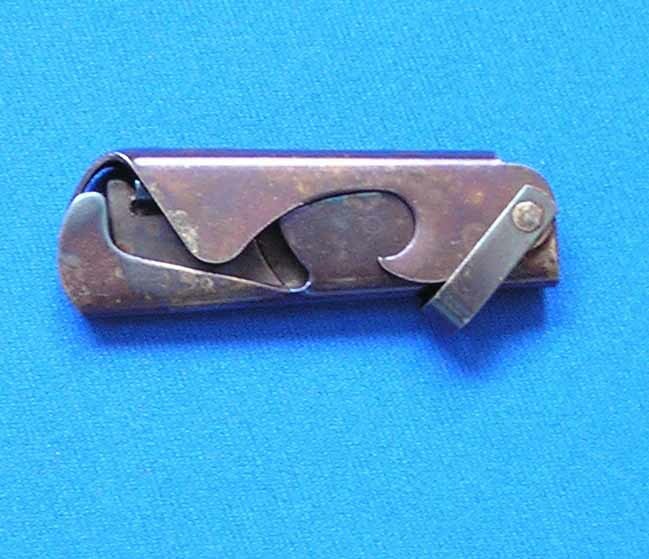 His Zippo sits in my pocket as well as that sturdy old Buck knife but I've had to buy my own "P-38" from an Army/Navy. It seems to have disappeared and the joke between my brother and I was that it went to his grave with him. You never know when you might find use for it. My brother and I were on our first deer hunting trip with my father and his buddy. I was 12 and my brother was 13 at the time. After our first full day of hunting we all met back at camp, extremely hungry and tired, and we got ready to prepare our dinner. We were going to be having steaks on the grill and pork and beans. As we were preparing our dinner for the night my father asked that my brother or I go and retrieve a can opener for the beans. After searching long and hard, and hoping that it wasn't my job to remember the can opener, I told my father that someone must have forgotten it. He stood there shaking his head in disbelief, "well looks like we won't be having beans tonight" he replied in a not so friendly tone. Then I remember his buddy taking his keys out of his pocket and holding them against the can and twisting them around and around until the top finally came off. I thought he was amazing to be able to open the can of beans with his keys and I asked how did you do that? Then he held upthis little gadget attached to his keychain that I had never seen before, and he and my father replied at the same time "the P-38". He and my father shared a pretty good laugh after that both having served in the Army. I had never heard of one or seen one up until that point, but I'll never forget thinking......that is the coolest little thing ever. So the P-38 saved the day, instead of having burnt steaks that night we had burnt steaks and pork and beans. my step father and I go to Seattle every year on a outdoor adventure with a high school buddy of his. This gent is special forces, live off the land bring minims in with you. after 2 hr logging road drive, hike in 1 hr in the dark 75 pound packs. He smiles and pulls out his wallet old leather and worn there is a nice indent from were he pulls the p-38 and how cool is that i say. At the end of every trip he thanks the lord for good times good friends and nobody died. Hey, thanks a million! 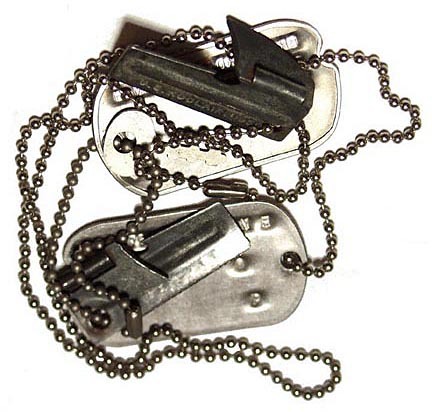 I still have the P38 that was on my dog-tag chain in Vietnam 67/ 68 - 176 combat missions on EC-47s. 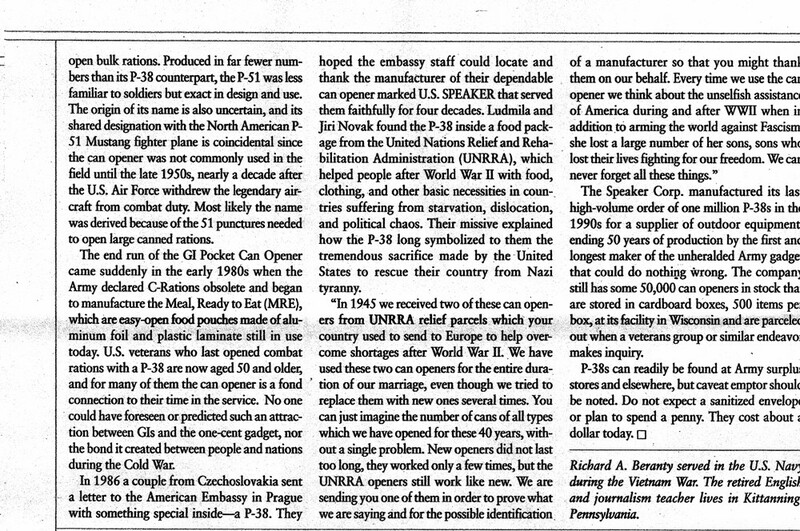 I had seen the P38 web site when my boss had his taken away by airport security - also from Vietnam . I can't think of a better "gimme" gift for my old GI friends. Every so often when we have a get-together at a little bar here in San Antonio that I first went to in ' 63 I call for a "P38 Check!!" (an old tradition) - and anyone without a P38 buys the next round(s)!! Back in the 70's I worked with an ex-Green Beret who was also an ex-POW. "Big Dave" had some great stories about Vietnam.I bugged him one day to tell me about how he got captured. "It was fast," he said. He and four other Berets were going someplace to blow up something and they were jumped and all of the guys that were with him were killed. Dave was wounded and the VC grabbed him. His attackers were all very young and proud of what they had done and decided to take Dave back to wherever they reported and show him off. They made him strip. One guy tied knots in the legs of his pants and stuffed his clothes in them and carried them,and another guy carried his rifle. The only thing he had on was his dog tags which they didn't make him take off. They walked all day and at night they tied him up and took turns watching him. On the second day two of the young guys made a small cage out of sticks and fastened the sticks together with reeds which were strong. They made Dave carry the cage during the day and at night they would put him in it and fasten the door with reeds. It was so small that he had to bend almost double and could not sleep. The third night he was wondering how he could get out of the cage and he remembered his P-38 that he had duct taped between his dog tags. He said a lot of the guys that he was with had sharpened their P-38s and would use them as a small knife. He had his taped between the tags like everyone else had done to prevent them from rattling and making noise. Dave untapped the tags and took out the P-38 and went to work on the reeds and cut them enough to get out of the cage. Dave said the young guys were all asleep because they knew he wasn't going anyplace. He grabbed his rifle and checked to see if they had left it loaded, which they had. He shot all of them where they slept. He got his clothes and got dressed. His feet were so sore he had trouble putting on his boots and his wound in his arm looked and felt infected. He headed back in a hurry the direction they had come in. It took him four days to meet up with some friendlies.He finally got back to his company only to find out that they had him down as being AWOL. After telling his story and showing them his wound he was given a nice R&R inJapan and a pat on the back..
Subject: Attn. P-38 Story, Here is my funny story. know what a P-38 is, It's a pistol"
BAM, less than 20 seconds he had that can of corn open. stories with everyone as I have done. I've carried a P-38 in my pocket since I was about 4. I've carried a P-38 in my pocket since I was about 4. 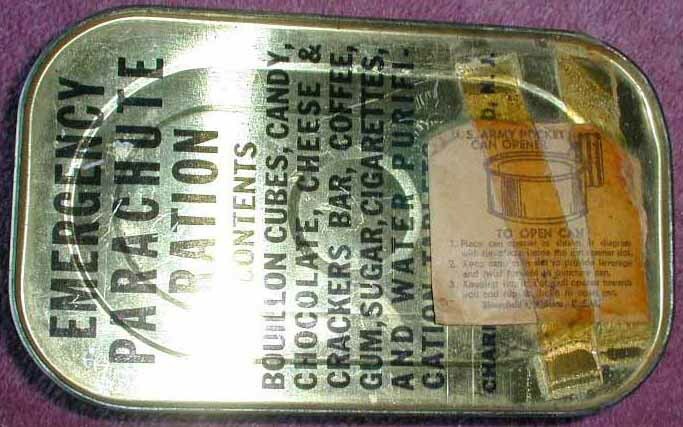 My brothers and me would get these from our dad who was in the US Army from the late 50s thru the early 70s, and Dad would bring home his uneaten canned rations sometimes because he didn't like 'em, and so we'd mostly just eat the candy and gum and hid around while we smoked the cigarettes they used to put in those. By the time I was 8 I could open a can of peaches with a P-38 in less time than it would take me to tie my shoes. You know how oftentimes if you get a P-38 that's not a tight one how it comes open in your pocket? 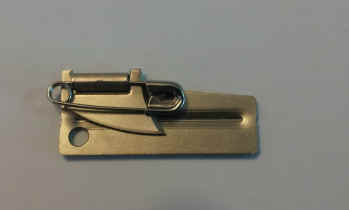 Well the simple fix I have for that is to get one of those freebie key fobs (a rectangle shaped one works best, or whittle a thin piece of wood or plastic into a rectangle shape and drill a hole in it for a keyring) and put it on the keyring next to the P-38 so the blade side is against the fob, then use a rubber band made from an old bicycle tube and wrap it twice around the P-38against the fob. That way the P-38won't come open in your pocket, and you don't even have to completely un-do the wrap either, just roll the band down enough to let theP-38 out to use it and vice versa. 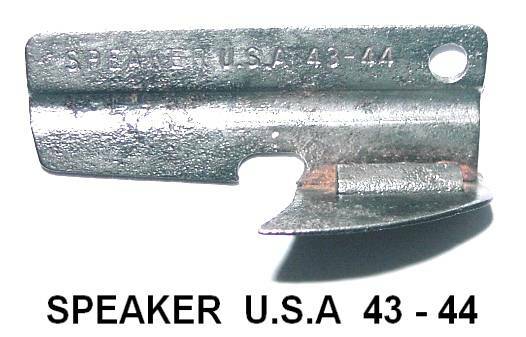 As for uses for a P-38, one I've never seen listed was as a spark plug gapper, and I have seen one used to set distributor breaker points (not perfect, but worked enough to get the car started, that's a variation of the old matchbook trick). In addition to the uses I've seen listed, I've also used mine to pry outspent shells from my old break-barrel shotgun when the extractor broke on me one day. Another time I used my P-38as a substitute for a thumbnail to open my pocketknife for a few days when I had2 sore thumbnails from shelling too many butterbeans. 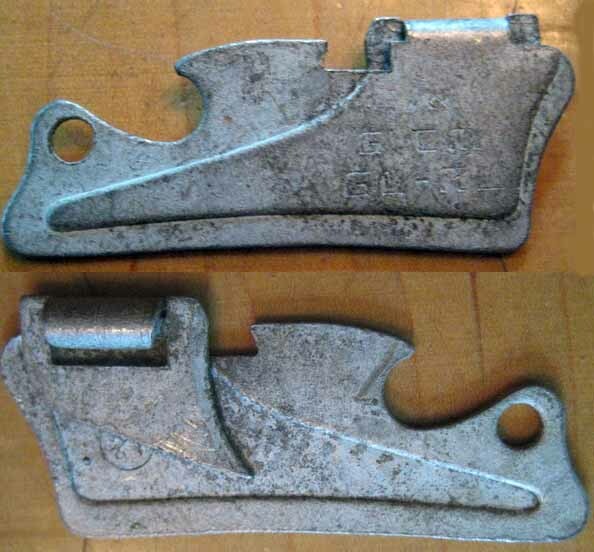 My old P-38 had a notch on one side which I made with a tiny file, so I could use it as a wrench to tighten up bicycle spokes, and the other side had a v-shaped notch, sharpened chisel-ground style just on one side, that I made with a little triangular file to cut things with at school because knives were frowned upon. P-38 training and qualification program. Thank you for your site! I have an old P-38 that was my dad's from his service in the U.S. Army between the Korean and Vietnam wars. I keep it in his old mess tin which my two children and I use when we "bivouac" out on the old back roads. His old P-38 usually opens cans of beans we dump in the mess tin and cook over a trioxane fuel bar. It's satisfying to think that such a little thing has such an amazing history and is continuing to help make memories on its second "tour of duty!" My p38 will be handed down to my son soon, it has many years left of use I am sure! Hi, in 1978 I got my first p38 when I was 15 from my uncle who was in Vietnam . At first I didn't realize the potential and endless uses for it! 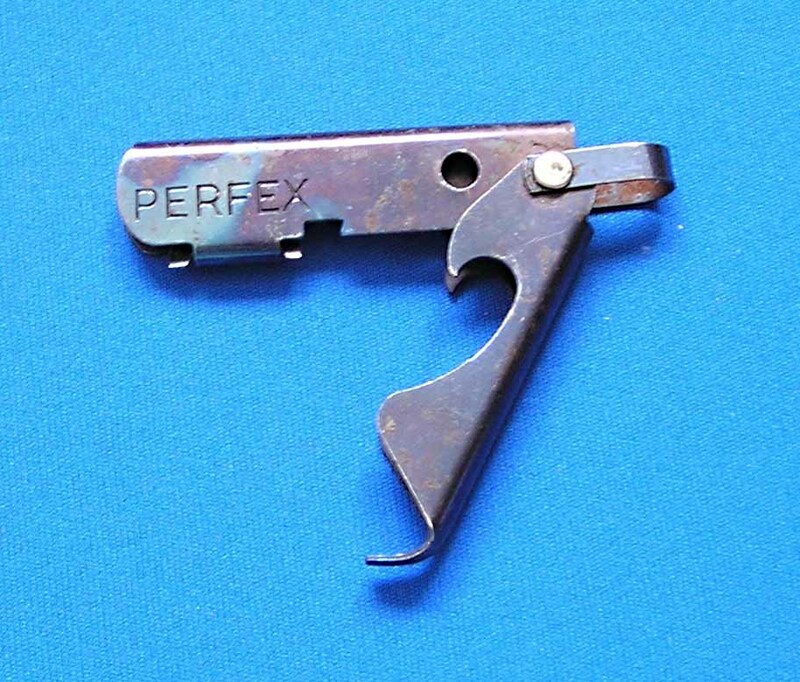 I became a construction worker and used the p38 not only for opening cans put cutting plastic sheeting, cleaning my finger nails, removing splinters, marking pipes for cutting, opening paint cans and a ton of other things too. 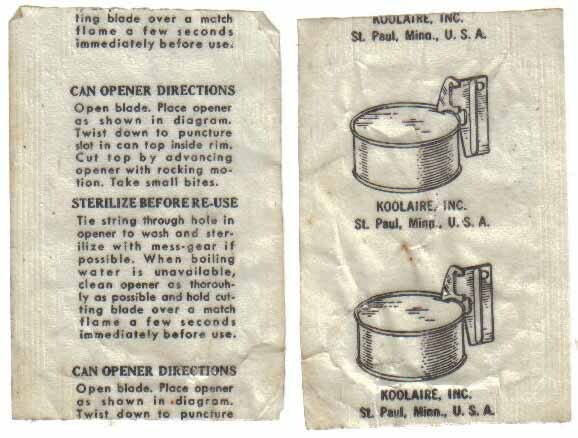 When I finally got married my wife one night was cooking dinner and was having trouble opening a can with one of those store can openers (1980's junk! ), I used my trusty p38 and tore through that can quicker than she could believe! From then on she used my p38 every time she needed it which caused some friction because she always misplaced my keys, I finally went to a surplus store and got her one which she still uses occasionally to this day but has switched to the newer electric can openers in our older years! My p38 will be handed down to my son soon, it has many years left of use I am sure! Nothing dramatic. My father was in the Reserves from after WW2 until his retirement in the 70s. He always brought home odds and ends from training outings At one point, I opened up a P-38 and used it to open some C-rats I'd brought with me on a Scout campout. This was during the VietNam war. I've had that same P-38 on my key ring ever since, where it resides today. It has opened countless cans, tightened countless screws (slotted and Phillips), pried open countless stubborn lids, used to wedge nuts in place until I could thread a bolt onto them, and other situations I'll probably never recall. I once used a pair of locking pliers on it for extra leverage. It has never bent, cracked, broken, or anything else other than losing its finish. It's sporting a nice polish courtesy of all the pockets it's been in. By the way, it happens to be a GO ARMY. I kept it originally because I'd never seen any others before or since. Thanks for the website, and thanks to all who've served our country. I logged on to your website and really enjoyed reading about your research into the P-38 and the companies that produced it. 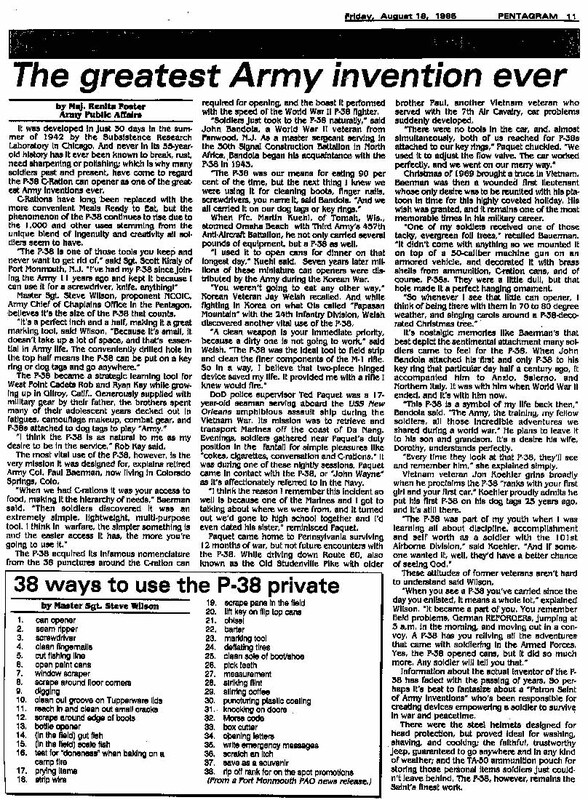 I am considering writing an article for our base newspaper and/or military journals regarding this little gem and will hopefully gather some documentation from the National Archives. What I find I will be very happy to share with you. However, here is my story of my P-38. After college and a degree in philosophy I enlisted in the U.S. Air Force on 2 July 1976, looking for something that college could not provide?? direction. I quickly adapted to the discipline offered by the military and the growing fraternal bond that military members experience. After our third week we were marched off to the M-16 firing range for two days of dry- and live-fire training. Our mid-day meals were c-rations which proved to be my life-long love affair with scrambled eggs and ham (I? ?m not kidding? ?I really liked them?? couldn? ?t stand the beef stew though). Included in the case were a number of little packages bearing can openers that I personally thought were somewhat cleverly developed tools. It was very interesting watching guys investigate these little contraptions. While eating we were joined by a couple of civil service engineering guys working on the range infrastructure who later explained had been in Vietnam in the early 70s. They (and the TI) showed us how to use them. One of them named Steve picked up the P-38 next to my boot and said this was the most practical thing the U.S. government had ever produced because it was made exclusively for the GI as a personal item to be carried through all sorts of circumstances. He handed it to me and said ? 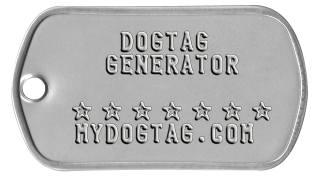 ?Put this on your dog tag chain and keep it there. It? ?ll survive a nuclear blast.?? He then showed me his key ring and the two he kept from Vietnam . He said ? ?This will be a constant reminder of where you? ?ve been and your time in the military.?? Like some mentioned on your website, he used his to adjust the carburetor on his vintage GTO. I took Steve? ?s advice and kept it on my dog tag chain. It went with me to security police air base ground defense training, my first duty station at Pease AFB, heavy weapons training at Camp Bullis and Fort Hood , my remote tour in Korea , the somewhat quiet 80s, the Gulf War, Balkans, and all the peaceful times in-between. During the peaceful periods it was with me on my key ring. The P38 now graces my silver necklace given to me by my family in the mid-90s. Along with my wedding band, my U.S. Shelby Co (with the little arrow thingy) P-38 is my most treasured piece of jewelry. I wear it permanently on a silver chain my wonderful wife and children presented me over 15 years ago. But why is it treasured? I? ?ll try to explain. Military folks have a special bond. We may be different in terms of personality types, genders, ethnic backgrounds, and so on, but we all served. And we served for reasons beyond ourselves. That? ?s what makes military folks so special. 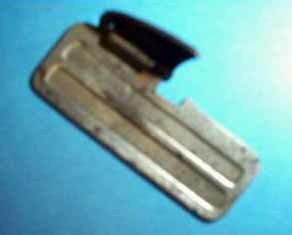 This little non-descript item called a P-38 is that little, personal item that was considered one of life? ?s little luxuries that, in many regards, provides us with a sense of identification when the world wanted to identify us by our skin color or religion. It? ?s similar to the dog tags, but it goes beyond the ??meaning?? of a dog tag. It is almost a fraternal symbol of sorts, one that is instantly identifiable by veterans that used them. My Shelby Co. P-38 also reminds me, every day, of my service, and I cherish it along with the flak vest my mortar team signed while in Korea . Unlike jewelry (and the current infatuation with ??bling?? ), jewelry calls attention to itself as a validation of ??self.?? A P-38, in its non-descript form, is recognizable by those that served beyond ??self.?? I suppose our P-38s are more than symbols of a time gone by. Our P-38s remind us of us. I have had several people ask me why I wear a silly little piece of stainless steel on my silver chain. More than once I have tried to explain, and have even grown a bit quizzical myself as I try to explain. More often than not, I stop, smile, and say, ? ?Well, if you have to ask, you really wouldn? ?t understand. It? ?s a bit silly, but you can? ?t really appreciate how special it is until you? ?ve used one under adverse circumstances.?? It? ?s not that we? ?re trying to be exclusive, but a civilian has a difficult time understanding what some of these little mementoes mean because they simply do not have provenance (context) with a specific event/place. Civilians (except for our awesome police, firefighter, and government peacekeeping corps? ?FBI, homeland security, etc.) rarely have to deal with dire circumstances that deal with the management, delivery, or receipt of deadly force. However, when a fellow vet from the 1940s to late 1980s views it, the conversation usually starts with ? ?Man, I used mine to do (you fill in the blanks because the stories are as varied as they are interesting)??. They then usually end the conversation with ? ?Man, I wish I? ?d kept mine. It was one thing in this world Uncle Sugar game me that meant something to me.?? However, another phenomenon occurs, a phenomenon that seems to occur with military folks. They usually connect the P-38 in context with other people and events under somewhat dire circumstances. Again, it? ?s hard to describe, but the P-38 (like the C-Rat spoon) my not just be the best thing the U.S. Government provided us, it may very well be the very best part of us who, as generations of citizen soldiers, have a small battle-scarred memento that reminds us of the days of our selfless service, adventure, and friends who departed defending their buddies and country. One can? ?t really carry around a Jeep or a grenade. But one can carry their P-38 (and their C-Rat spoon). In museological terms, the time-place empathy theory really abounds here because the P-38 is an artifact with context and personal context at that. Just watch/listen to any vet when they view the P-38. Complaints of how much they hated C-Rats will probably be the first comment, but they identify with the P-38. Again, social scientists and psychologists will have a difficult time with developing a theory. That? ?s because the P-38 represents the best of us all? ?our humanity and soldierhood. 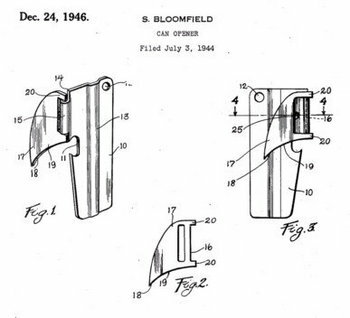 And maybe, just maybe, those that designed the item sixty some odd years ago with that little hole had something a bit metaphysical in mind. If so, it was brilliant. Of all the Government Issue items, this little piece of stainless steel grown grey with time (and body sweat) provides me with more memories and ??provenance?? of time/place than any other. And, for that, I would like to thank the designers (God bless em?? all). Maybe that? ?s why we cherish it so much. Anyway, while I don? ?t wear the C-Rat spoon, it? ?s been with me on most deployments and served copious amounts of peanut butter. And it fits my mouth. Over the past year I have re-initiated a small ceremony for our folks that are deploying to Iraq and Afghanistan . During that small office farewell ceremony I present them (military and civilian alike) with a dog tag chain with a current P-38 and pass on Steve? ?s words. ? ?Keep this close to you because you will use it. And when all of the bad memories of death and stress have gone away, the P-38 will remind you of those great people you served with. Don? ?t try to figure it out. Just keep it and remember it in years to come.?? Today, I? ?m saddened by the fact that we do not have an issued icon like the P-38. Some guys still carry a grenade pin (which is also a great item) or other items they hold dear to a particular experience. Challenge coins seem to have taken the place of these little items but have become somewhat too commonplace (they personally never really held any special significance to me). Now, the P-38 was made by the U.S. government exclusively for GIs and those of us that have them know how important they really are because they have context. Challenge coins rarely have context in a battle environment, unless they? ?re presented in such circumstances (and, if so, then that? ?s absolutely wonderful because they hold special meaning to those individuals). A challenge coin, however, is/was not made by the government exclusively for the soldier/sailor/Marine/airman/coast guardsman. 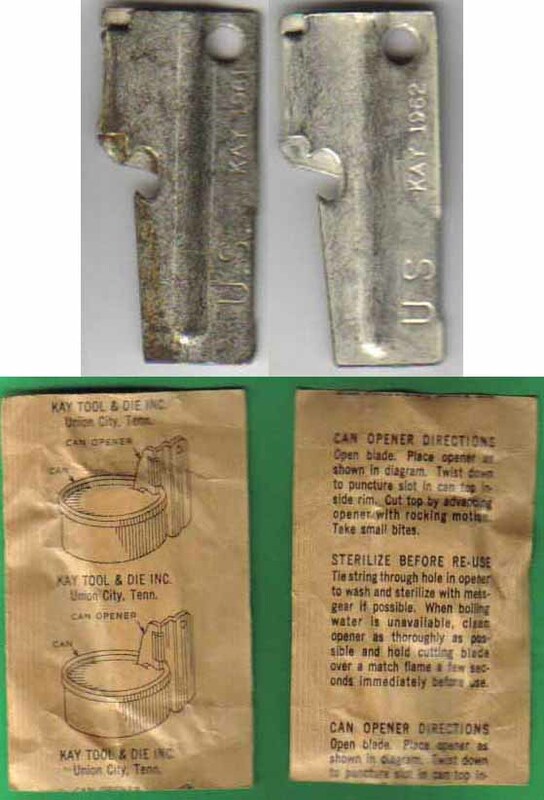 A P-38, grenade pin, C-Rat/MRE spoon is/was. Now THOSE are challenge items! It? ?s a bit difficult to describe, but the P-38 represents more than a commercially-made icon. 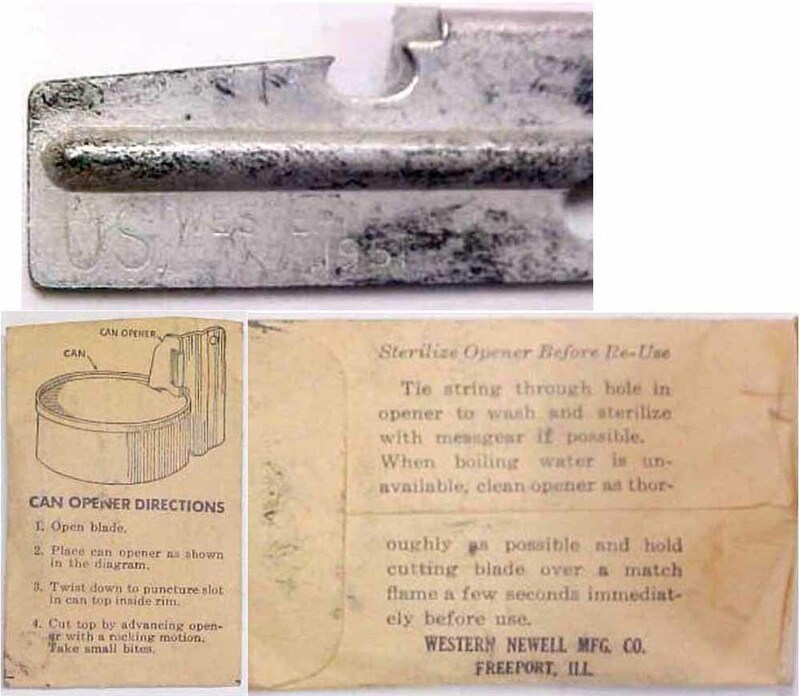 Something you used with a U.S. marking is an artifact. Something you had commercially produced, well, that? ?s still debatable. Again, these are my opinions. But I have 75 challenge coins and none of them hold special provenance or context. My P-38 does. 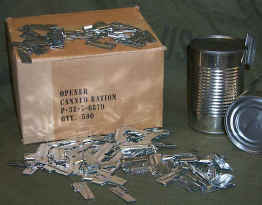 While on active duty and civil service time, I have used my P-38 for the following: Opening cans (I can? ?t even begin to even estimate the scores of B units and beanie weenies it? ?s opened), cut MRE packages, sliced tape, opened boxes (including MRE boxes, which I don? ?t like as much as c-rations), scraped goo off my jungle boots, fixed the screws in my glasses, trimmed thread from my uniforms, and the list goes on. It even helped trim lace on my daughter? ?s wedding dress in 1996 when no one could find a pair of scissors. Sorry to ramble, but this is the best way I can describe what my P-38 means to me. I can? ?t even explain it to my wife of 32 years. She only smiles and says ??I? ?m happy it makes you happy.?? I? ?m a blessed man. Incidentally, I also asked her to bury it with me to inform archaeologists 10,000 years from now of the ancient ? ?Shelby Co Culture.?? Will I pass it on to my family? Probably not, because only the owner understands its special meaning. There are several P-38 stories to be told. 1. I am a high school administrator in my civilian job. One day we were doing a classroom search for weapons and drugs when I noticed a detective had taken a student to the side for questioning. The officer had found something suspicious on him. When I approached I saw the item was a P-38. The cop had no idea what it was, or its use. The kid told me his brother was a Marine in Iraq and had given it to him as a gift. I explained to the cop that it was not a weapon, and suggested the student leave his prized P-38 at home to avoid problems. 2. I am a National Guard CW4 with 40 years in the Army on my second deployment to Iraq and the Middle East. My trusty P-38 still hangs from my dog tag chain. It is as useful as ever, but I do have to explain to the children what it is and how to use it. 3. Another odd use for my P-38 was to set the points on my first car, which was a 1929 Model-A Ford. The thickness of the steel was just right for the point gap. 4. I bought my first P-38 in the 1960s when I was in high school at Long Beach War Surplus, Long Beach, CA. I didn't know I would have it 45 years later. I bought two at the time, and lost one at Fort Ord in 1968 as a DI there. 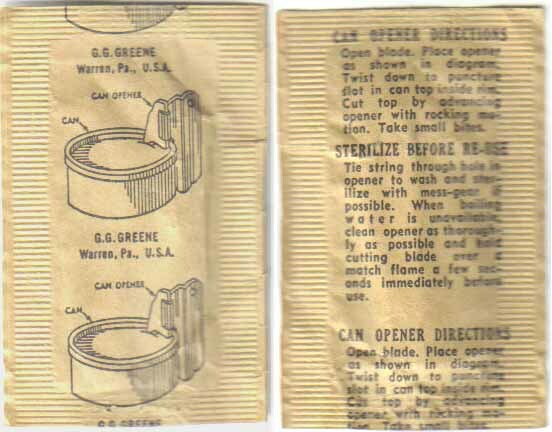 They were GG Green, 1962, production. 5. The P-38 on my key ring I have carried since the '70s. 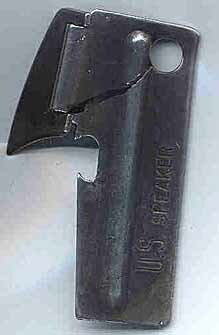 The blade side is sharpened for use as a box knife, although it does not hold an edge very well and requires frequent sharpening. It has traveled all over the world without any problems in airports. 6. Back in the C-Rat days I gathered all P-38s I could get from empty ration boxes, giving me a reserve stock to pass out to kids at school and even teachers. At the time I thought the supply would dry up with the loss of ration cans. I was happy to discover they are still in production. No doubt there are more, but six is probably too many. Take care. You have a fun and informative site. I joined the U.S. Army in 1983 at the age of 18, and went through basic training at Fort Leonard Wood, MO. During field training I was given a P-38 to open the c-rations we were given for meals. The drill sergeant was quite emphatic when he said "This is the only one you will get. Don't lose it." Fortunately I didn't lose it. I carried it on my keys for 20+ years and found it a very useful item. It was with me in Colorado, Germany, The Netherlands... everywhere I went I took it knowing I'd probably need it. 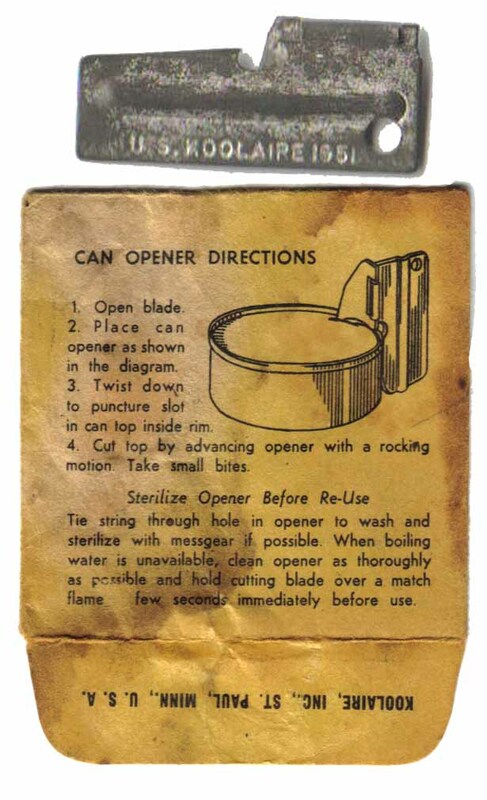 I used it to open cans the intended way but also to pry open paint cans, as a bottle opener, scraper, Phillips screwdriver, straight screwdriver... plus so many other uses I can't remember them all. It was well used, often opened in my pocket and poked me in the leg but it still opened cans as easily as the first I used it on. Unfortunately a few years ago I was swimming in a friend's pool and had my keys in my shoe. 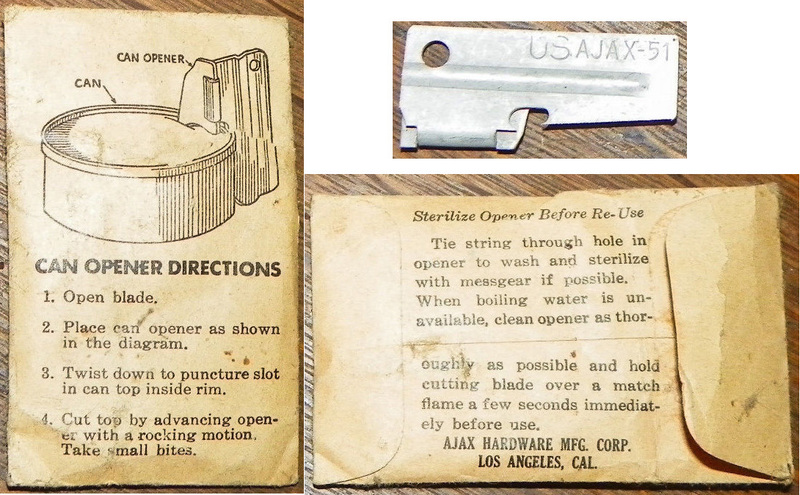 On my key ring were my P-38, a pair of folding scissors, and a pair of mini hemostats. When I finished swimming and prepared to leave I found my utility ring was gone. Over the last few years there have been many times I wished I had my handy little P-38. I really missed my good old Mallin P-38. Last week I was shopping on eBay and buying equipment to do a bit of camping this summer. I had purchased a dome tent and decided to see what else the seller had. What did I find? P-38s in various quantities from 5 to full boxes of 300! I bought a lot of five. The package containing the tent and P-38s was delivered today and I now have four of the five I ordered on the table next to me (I've already given one to my mother). 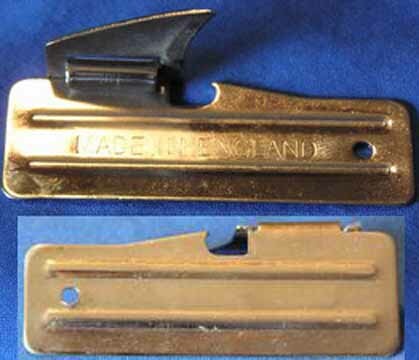 They're made by a different manufacturer and are labeled MIL-J-0837 so I'm not sure how they compare to the Mallin. Only time will tell. Hey Jim, I had stumbled across www.georgia-outfitters.com and while reading all the different P-38 stories, became somewhat upset over people having to give them up while going through Airport Security. Especially when they had religiously carried this unitfor many years, after acquiring it during unusual times or from a special person. However, we must take into consideration this is the same organization that almost didn't let General Joseph Foss (USMC Ret.) board his plane a few years ago because none of them knew what a Medal of Honor is and wanted to confiscate his as it looked like a potential threat to National Security. If they should try to make one give up their P "the only thing the military ever really got its moneys worth on" 38, you should politely inform your (at this present time) personal TSA representative that their list of prohibited items does not mention a "US ARMY PERSONAL CAN OPENER", an "OPENER, CAN, HAND, FOLDING, TYPE I", aP-38 or even describe anything that resembles it. 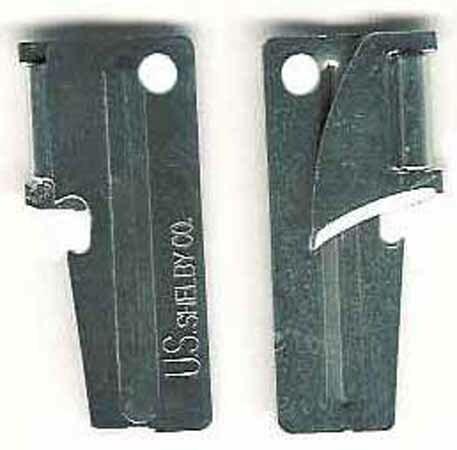 However, after carrying a P-38 all these yearsand personally witnessing the damage it can do to the pocket of a brand new pair of Wranglers, you can understand their concern, and if they will point out the little kiosk that allows you to mail prohibited items back to yourself the matter will be taken care of. I'll bet I just bought myself a trip to the "Can you step over here please" area the next time I fly. My wife is gonna be thrilled. I had to do this once before when every national news servicereporteda relaxing of restrictions allowing passengers to carry a small pen knife, scissors, nail clippersetc. When TSA wanted to keep the Gerber money clip/knife I got for my fiftieth birthday, I realized what I saw on my TV might not have been accurate, go figure. My Dad gave my brother and myself each a surplus shelter half, mummy sack, mess kit, canteen and P-38 for Christmas about 1964 or 5. You add a couple of toy Tommy Guns and my little sisters (she was about six) pretend Nurse Kit and we're talkin weeks and weeks O' back yard fun. The shelter half probably became a winter cover for one of the dogs with pups or an old motorcycle and the mummy sack lost about half its feathers and has been replaced by some of the vastly superior modern technology. However it's still in my garage just in case. The canteen with it's metal body and rattling chaincap sit next to it. The canteen cup is now an important part of my canteen upgrade. You know, the plastic one with the nylon cover and the little pocket for water purification tablets. This combo lives in a Craftsman Backpack along with the mess kit. The mess kit (dated 1951) is still complete and other than being permanently black on the bottom from hundreds of fine campfire meals and both halves nicked from being lent to newbies for Snipe Hunts has no flaws. The backpack also has a change of clothes, emergency space blanket, compass, Randall Survival knife, first aid kit, 3 or 4 MRE's and the other usual stuff. Whenever my dog and I leave town it gets thrown behind the seat of the truck first. But my P-38, its been in my pocket or the ignition of some vehicle I'm drivin' for pretty much the last forty some odd years. I opened a large can of coffee with it just a few weeks ago. Still works like a charm. I'll miss a flight before losing it. I just hope the metal around the key chain hole can hold out for another 30 or 40 years. I'll be contacting you and if the new Shelby Co. ones are the same quality we'll be placing an order. It's been a pleasure reading the stories on your web site. Sir, I obtained my Mallin P-38 in 1967 while serving in Vietnam as a Marine infantry combat soldier and I? ?m still using it to this day, in fact I used it today! 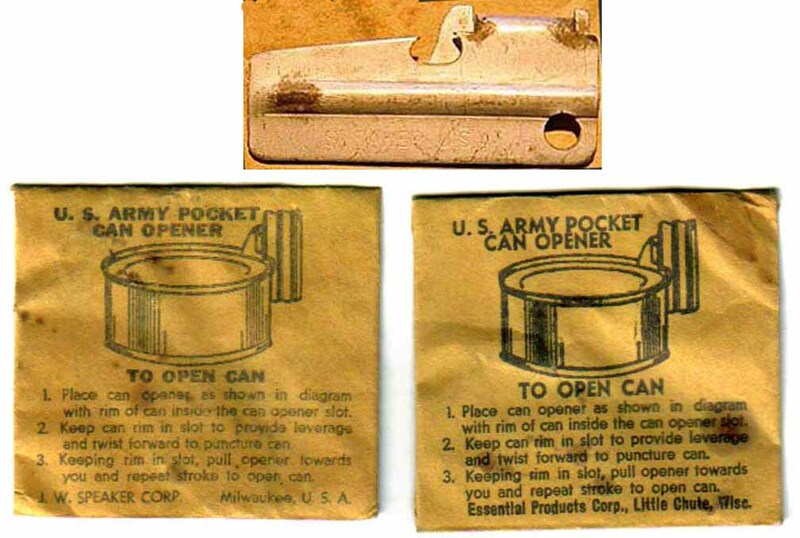 I also used it when I served in the Gulf War as a DOD Civilian to open the MRE packages. Not only have I used it to open C-Rats in combat, I? 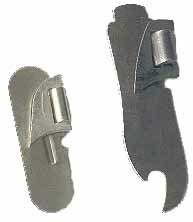 ?ve used for opening oil, grease, and beer cans. It? 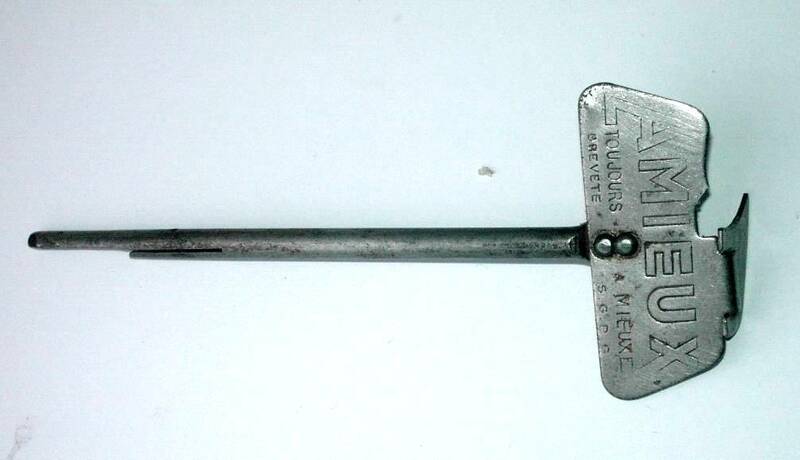 ?s been used as a screw driver for working on vehicles, zip-tie cutter, also used to open packages and plastic bags not to mention toys for children and later grandchildren. It a constant companion on my key ring. It? ?s one tool I? ?ll never be without. The P-38 has to be the most low-cost high-yield investment the government ever made. When I use my P-38 I have a lot of memories attached, both good and bad but I wouldn? ?t be without it. My wife is also a Gulf War veteran and kept her P-38 from her Air Force basic training in 1983. She said it was the only time she was given C-Rats, after that it was always MRE??s. It is a ??U.S. Speaker?? P-38 and stays on her key ring also. I wanted to tell you how much I've enjoyed your page about the P-38. When I was 18 I went to college at Ohio State and didn't want to pay for a dining hall meal plan. So I moved into my dorm room with an illegal hot plate, a supply of Chef Boyardee and a P-51 given to me by my dad (a Vietnam Vet). I used it throughout my college career and it now resides in my families camping gear. Last summer I had the pleasure of of teaching my son how to use it and giving him the history of how I got it. I like the idea that some day he'll be teaching his kids how to use the very same one that my dad sent me off to college with. We have a couple P-38's too, but I'm particularly attached to that P-51 from my dad. The little P-38 saved the day during a power outage. I Joined the Army in 1982. We were still eating C-Rats. During basic at Ft. Benning I managed to get my first P-38. Then during training at Ft. Lewis I acquired a second one and a P-51. 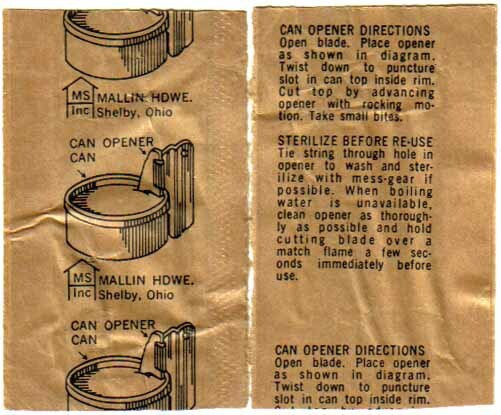 I kept them and used them often for more than opening cans. In 2009 we had an ice storm that knocked out power. My neighbor asked me if I had a manual can opener she could borrow. I gave her one of my P-38s. She looked at that little piece of metal and then at me as if I had lost my mind. I knew her husband was a Navy Veteran and told her he would know how to use it. So the little P-38 saved the day during a power outage. Her husband had never used on but knew what it was and how to use it. I let him keep it since it saved the day for him. The funny part of the story is that I use a P-51 as my only can opener. I have been through numerous manual and electric can openers over the years and they all have broken but my P-38 and P-51 are still working after almost 30 years. For the last 10 years they've been all I use. 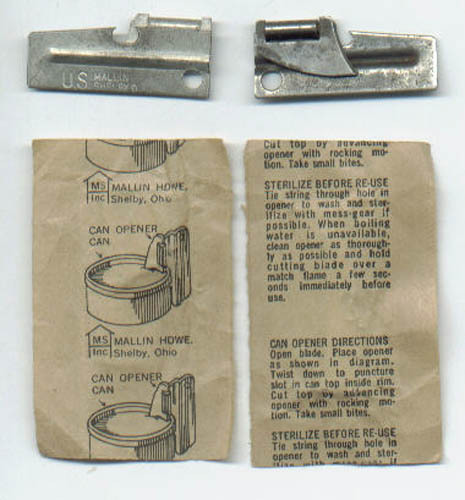 I just can't see spending money for modern can openers that break after some use when my p-51 and P-38 can do the job without breaking. 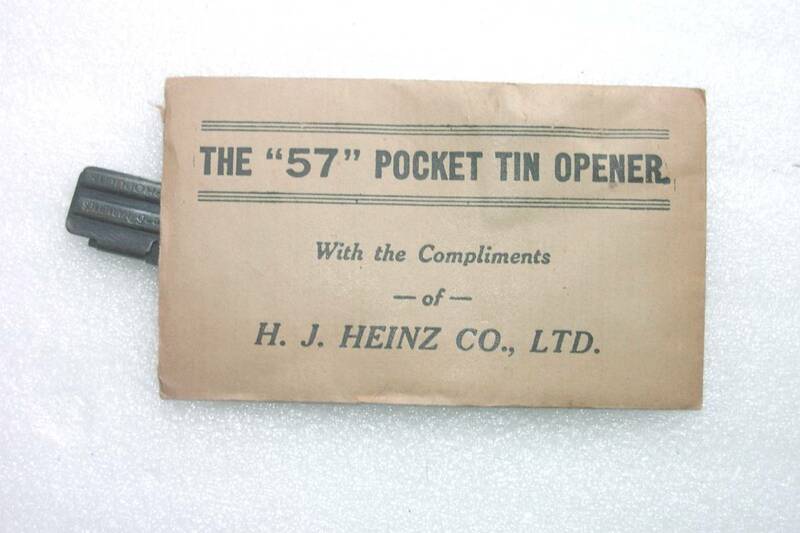 So until they invent a can opener that will last, I'm sticking with the tried and true P-38/51. I am placing an order for some P-38s and P-51s. I decided my Army issue ones have earned retirement after 29 years of honorable service. I will use and carry the new ones so I don't have to be upset if I loose them. Was just thinking about what to get my grandsons (age 2 to 16) and it occurred to me that I have been carrying something on my key chain since about 1968, and thought it would be a good gift for them. 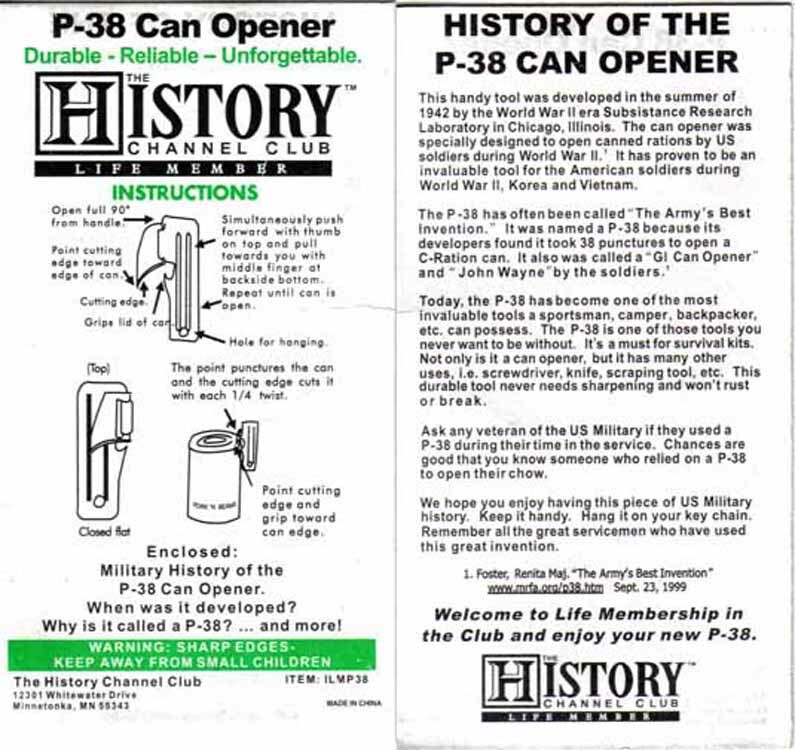 After a quick Google search, I found your website concerning the P-38 can openers.That would be an Ideal gift for them... Anyway, here is a story of mine.. 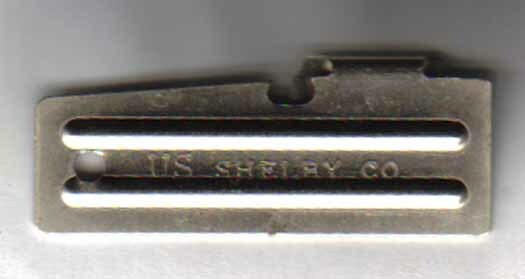 The one I have is a Shelby Corp with the symbol as shown in your picture of the1P38SHELBYVG. I was in the Air Force stationed in Thailand when I first obtained mine. I worked a lot of night sifts and after awhile the C-rations tasted better than the chow hall. Of course after a few cases we all had a P-38.. The AFCS amplifier was located on the floor behind a kickpanel,on the left side of the rear cockpit. I told the Pilot that I thought I could fix the problem faster than his crew could shutdown and move to another aircraft. He told me to try.. I had the pilot in back get out of the cockpit and stand by on the wing. I then got in the aircraft and using my P-38unlocked the dzus fasteners and removed the kick panel, opened the access panel on the front of the AFCS amp, and as the pilot engaged and disengaged the roll aug, adjusted the trim potentiometer until there were no engage transients. I then reinstalled the panels, got out of the plane, the pilot returned to the back seat and the aircraft departed on it's mission no more than 5 minutes later than planned.. and the only tool I used was the P-38.. Needless to say, this two striper was pretty happy and excited and the chiefs and colonels watching were amazed that a can opener fixed their plane. 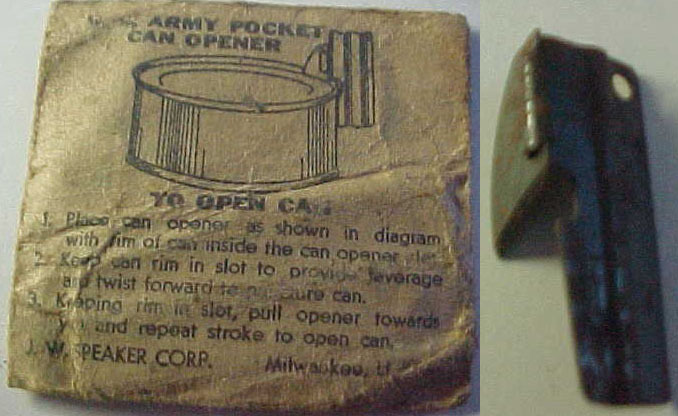 I don't have many mementosof my 22 year career in the Air Force, but I still have and use that same can opener. So, if you could let me know what P-38s you have available I would appreciate it. I have purchased some from a 'surplus' store but they broke in no time.. Just not the hard steel quality of the originals. The ones like I have will never break.. I served on active duty in the Navy between 1979 and 1983. 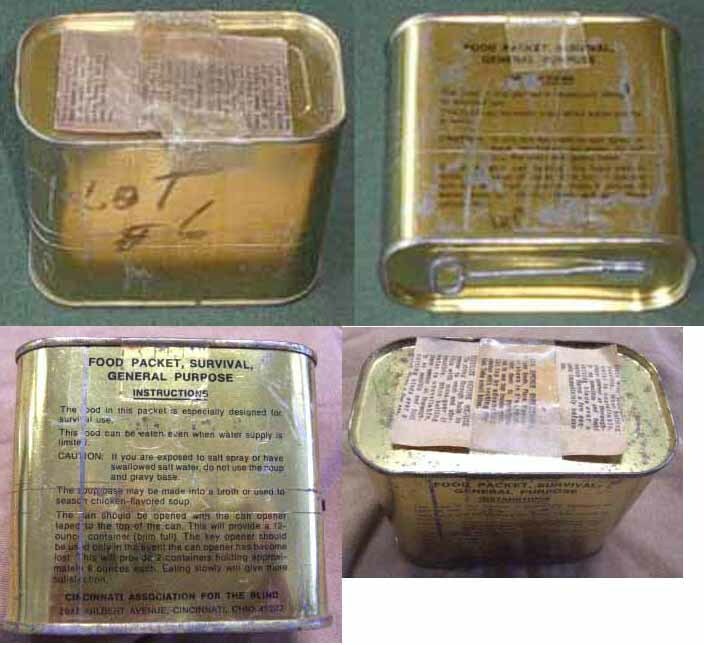 Unfortunately, the only time I ever had C Rations was while I was in training at the Naval Aircrewman Candidate School at NAS Pensacola, FL. 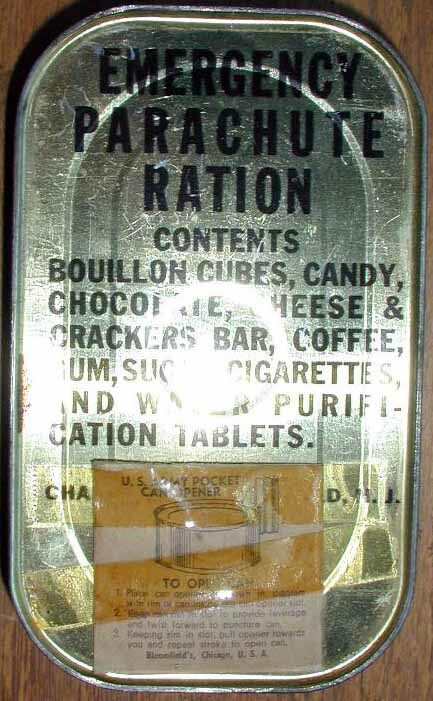 C Rations were replaced by MREs not long afterwards. Part of the Naval Aircrewman Candidate School curriculum was a week spent out in the woods at Egland AFB for land survival training. During the first day or two of land survival training, before we were set loose to "live off the land" for a few days, we were fed C Rations for breakfast, lunch, and dinner. Most of my fellow aircrew candidates did not like the C Rations, but I did. 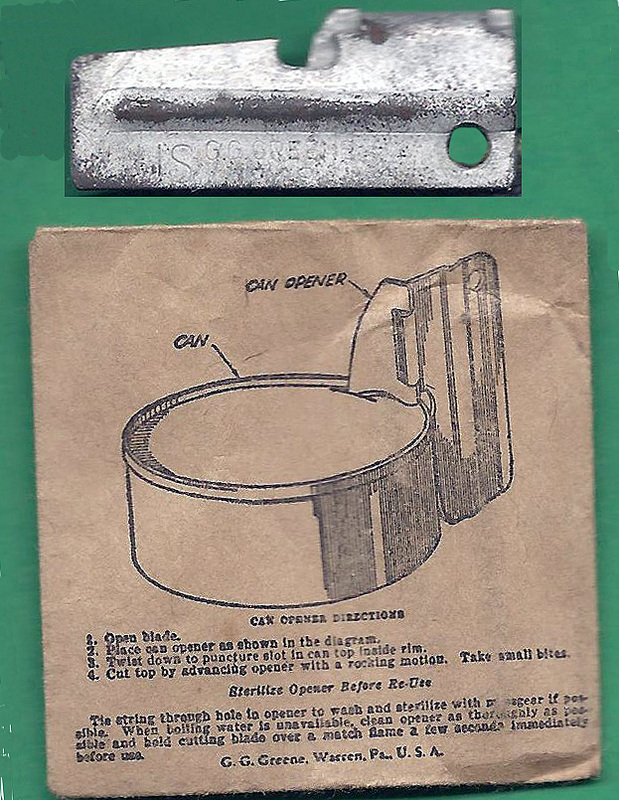 The instructors told us about the P-38 can openers that came in the C Ration boxes, described how useful they were, and encouraged us to keep one and secure it to our dog tag chains, which I did. Many months later, having completed all phases of formal training as a Lockheed P-3B Orion non-acoustic sensor operator, I was assigned to Patrol Squadron 8 (VP-8) home-ported at NAS Brunswick, ME. 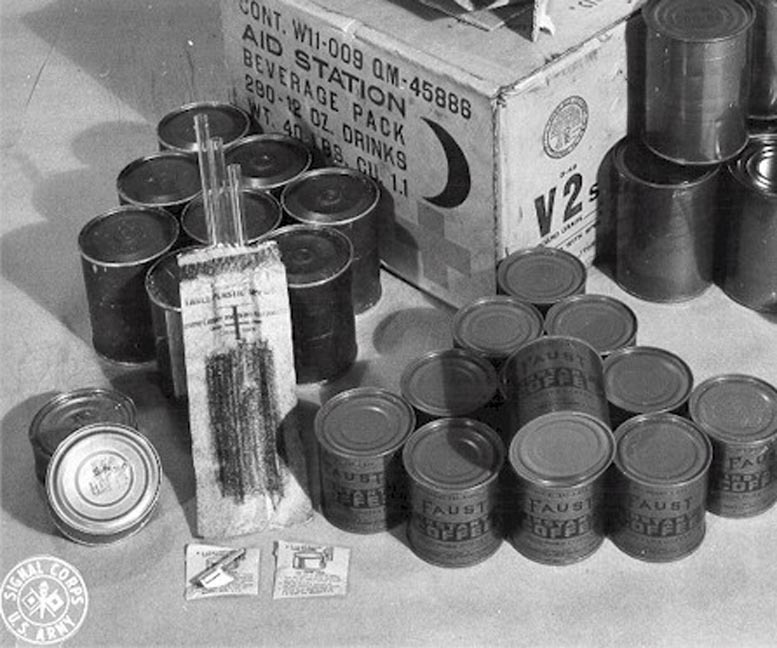 During my very first flight with the squadron I noticed that most of the other experienced guys on the aircraft had brought canned spaghetti, soup, or beef stew with them that they heated up in the cans in an electric convection oven located in the small galley in the back of the aircraft. For my next flight I went out and bought a large can of Spaghetti-Os. When I got hungry, I peeled the paper label off the can, put it in the convection oven, and hit the button that turned the oven on. Twenty minutes later I put my Nomex flight gloves on, opened the oven, and pulled the can of Spaghetti-Os out. The can of spaghetti was bulged-out on both ends. Holding it firmly in one heat-resistant Nomex-gloved hand, I reached my other hand into the open top of my flight suit for my P-38 can opener, which was still secured to the dog tag chain around my neck. I punctured the top of the can with the P-38 and KABOOM - there was a loud explosion followed by a piercing scream like a steam whistle. A jet of tomato sauce that had been turned into live steam shot straight up out of the small slot cut by the P-38, splashing my face and the vinyl plastic covering the "ceiling" at the top of the fuselage with bright red goo. I dropped the can, which rolled around on the aircraft's deck streaming tomato sauce steam and making a big mess, and ran forward to the cockpit. When I punctured the can with the P-38 the pilots heard the explosion and the scream of the steam escaping from the hole. They were calling the crewmen in the back (I think this was a local area pilot training flight with just me and another guy serving as observers) on the intercom and asking what had happened. When I came forward into the cockpit with my face covered in tomato sauce the two pilots and the flight engineer initially thought that I was bleeding to death! One of the pilots actually got on the radio and began to declare and emergency before I was able to explain what had happened! Basically, what I had failed to realize was that everybody who put a can of something in the aircraft's oven poked a vent hole in the top beforehand to allow the steam to escape. I never made that mistake again. Everybody on the aircraft got a laugh out of what had happened once they realized what had happened, except for me. I was the one who had to clean the mess up in the back of the aircraft. There was tomato sauce covering everything near the galley. That particular aircraft, a P-3B, always had a red stain in the vinyl overhead covering directly over the oven that we were never able to scrub out. It carried that stain until we sent it to the Boneyard at Davis Monthan AFB when the squadron transitioned to P-3Cs during 1982. For all I know it is still sitting out in the Arizona desert with that red stain in the overhead. I still have that old P-38. Its still attached to my dog tag chain along with my dog tags. It served me well over the course of about 3,000 hours flight time on various model P-3 Orions over my 20 year career in the Navy and Navy Reserve with VP-8, VP-MAU, and VP-92. I wanted to relay another P-38 story to you. A few years ago, our jeep club, Blue Mountain Jeep Alliance was holding it's annual Turkey Fry and four wheeling event. As a trustee of the club, I was helping out in the kitchen that day instead of being out four wheeling. I was asked to go out and purchase a few things that had been forgotten that day, so while I was out, I also picked up a cheap electric can opener. Keep in mind, we're on the side of a four wheeling trail for this event. But I knew that our head cook had a power inverter in his jeep or at least he used to! So much to my bewilderment, I had an electric can opener that was now useless! We had many different cans to open up for our Thanksgiving meal on the trail ranging from cranberries to corn. We were preparing a feast for 100+ people that day. Thankfully one of our other trustees arrived a little bit later and saw our dilemma. "Doc" who was a 20 year veteran as a Navy Medic attached to the Marines reached into his pocket and pulls out his trusty P-38. He immediately goes about opening the multitude of cans that still needed opening for our feast. Good old"Doc" saved the day! Later that same year, at our Christmas Party, I was awarded what we called a Slammy Award. The Slammies are an award that are given out to a Club member who manages to do something so incredibly stupid that it's funny. Needless to say, my award that year was entitled "The P-38 Award!" Symbol of improvisation at its' purest. My Mom's 2nd husband gave me one in the 90's to carry around because I always have been a bit of a gadget collector. He was a Viet Nam vet (101st airborne), and while not brimming with stories about his time there, he loved to give tools and gear that proved themselves out in the field to those he knew would use them. I still have it with me, many years after a good man passed from this world, and although I never until recently knew of the history, or all the non-standard uses it has, I am happy to find out I am one of many to discover the right ways to use the wrong tool. It is a symbol of improvisation at its' purest. As a side note about TSA confiscation, if you leave out the unfamiliarity of the P-38 with the younger set, the laundry list of uses may also be applied to maybe (possible stretch, I know) the final priming or assembly of a troublemaking device. 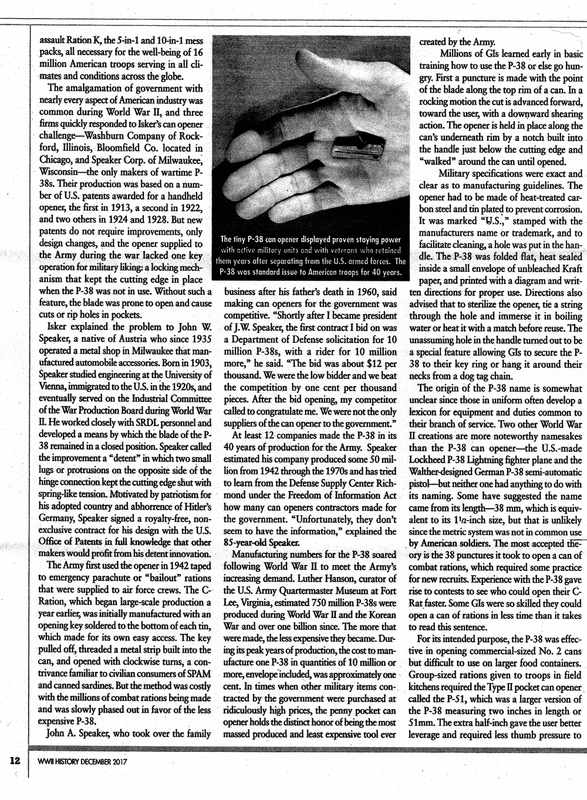 When Gary Powers was captured, the Russian press of the time called his simple Swiss Army knife "A sophisticated espionage tool kit" or somesuch. Lack of Common Sense sometimes applies to both Good Guys and Bad, I guess I have heard that some folk mail their pocketknives or other similar stuff ahead of time to their destination. Then, when it's time to go home, do it again, and have it waiting when they get there. 38s and 51s should be easy to send on this way. Thanks for an informative and entertaining website. Hi, I'm 17 years old and I'd like to tell a P 38 story. I got my first P 38 about 2 years ago. It wasn't a "real" P 38, it was a reproduction with no markings on it. I got it from a WW2 reenactment shop from the internet after spending a long time finding one. Here in Switzerland, the P 38 isn't very common, so I got the first I could find here. Anyway, I carried it on my keychain but it began to rust, so i realized it was a copy but it still worked. I put it in a glass of coke and it became less rustier. A year ago, I went to Israel and took my P 38 with me. On the Tel Aviv airport, where they have very serious security rules, I thought thy would take it away from me but I was lucky. I held my can opener all the 5hrs back to Europe in my hand. but 6 months ago, my trusty "old" P 38 became rusty again. I t became so rusty that I couldn't use it any more. So I put into a old cigar box where my great grandfather's WW1 dog tags and medals are. 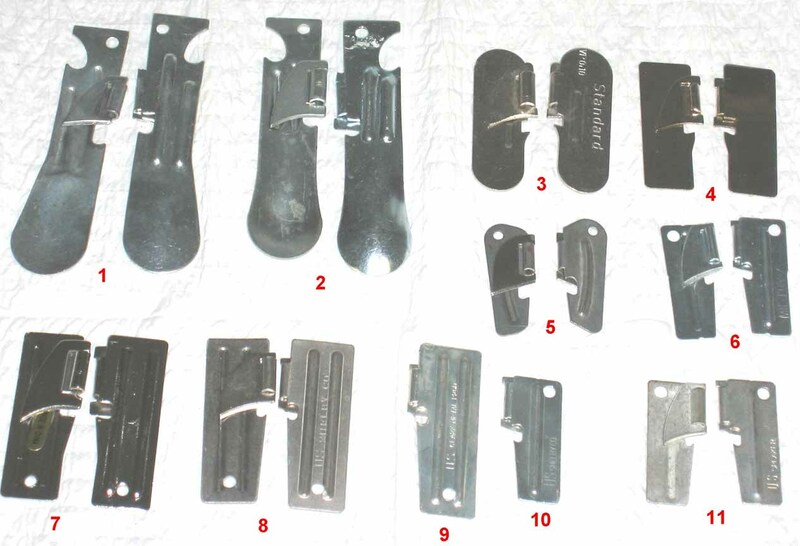 Now I have more than 1 can opener, I've some Shelby's, a couple of freds and two US P 51s. My new P 38 is a Shelby one which I keep on my dog tags. But I will never forget how many times my P 38 helped me during these years and I hope it will help me for couple of years more. I was a Navy Radioman who served two Western Pacific cruises during the late Viet Nam era aboard the USS Cleveland LPD-7, an amphibious assault ship. My ship was a workhorse that was continuously called upon to transport combat Marines, Beach Masters and not infrequently even UDT SEALS. We hauled no end of troops, tanks, trucks, jeeps, helicopters, munitions and God knows what else. Being Navy we consumed C-Rations on a very limited basis. More often we sailors came into possession of our P-38ï¿½s by way of the embarked Marines. I took to wearing one on my dog tag chain like most everyone else, but in my case it perhaps was more for show. Being a gear head I developed an instant affinity for that little metal symbol of military service and camaraderie. Ironically I ended up using my P-38 a lot more after leaving the military. My first apartment was a small one bedroom affair on the top floor of a three story building. Being poor, single and not much of a cook, I relied heavily upon canned food for my meals. 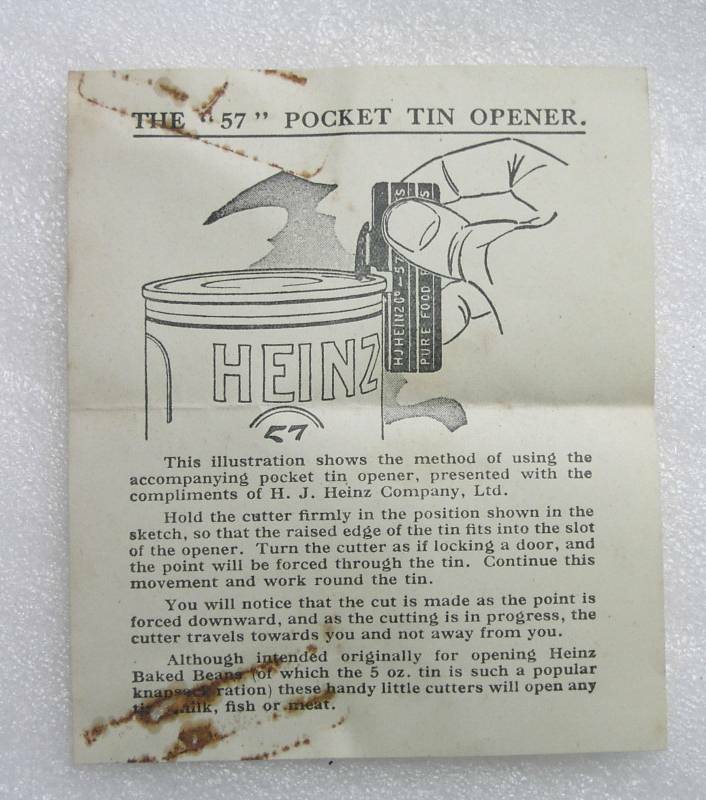 Mind you this was in the days before everything was the pull top, easy opening cans. 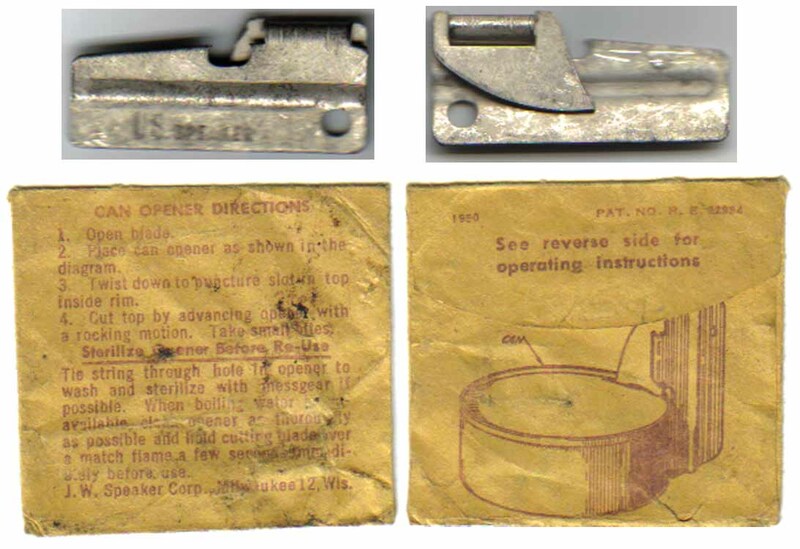 Not having money for a ï¿½realï¿½ can opener, the P-38 was called back out of itï¿½s brief retirement. Before long I hung the P-38 from a tiny nail that Iï¿½d slipped between the boards of the apartmentï¿½s kitchen cabinet, just over the electric stove. There it remained virtually invisible but readily at hand whenever it was needed to open yet another can. I found that the P-38 did such a perfectly adequate job that in the entire time I lived there I never felt the need to buy a regular can opener. After six years in that apartment, my fortunes had improved so much that I was able to have a new three bedroom house built only a few miles away. I was not at all sad to leave that apartment. But since that P-38 can opener was so tiny and practically invisible that quite sadly it was overlooked during the haste and excitement on moving day. I feel sad that an old friend was left behind in that apartment. 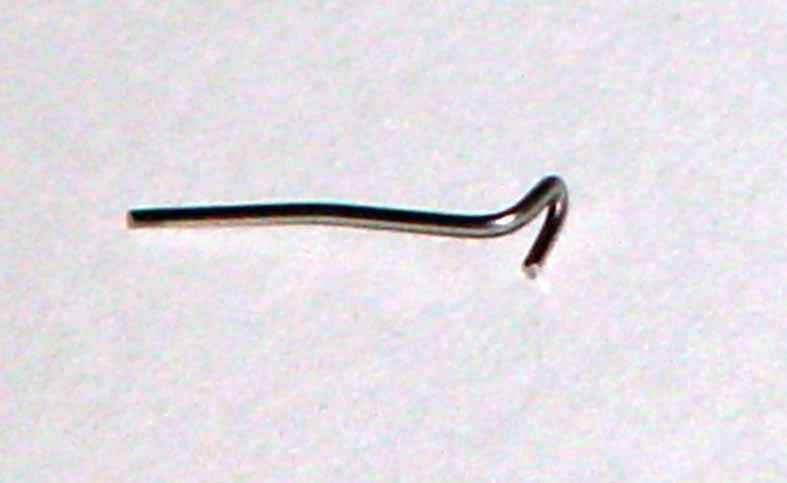 But sometimes itï¿½s fun to imagine what the apartmentï¿½s next resident must have thought when they discovered it hanging on that tiny nail over the stove. You can always tell when a P-38 is old and well-used because they take on a dark gray, almost black patina from being exposed to sweat and perhaps acids from food. That was 25 years ago. Do you supposed that it could be possible that little P-38 could still be hanging there after all of these years? I have owned many more P-38ï¿½s in the decades since. Military surplus stores always seem to have them out on the counter for sale, and I canï¿½t resist buying a few. I like having them around for camping and emergencies and as little reminders of a previous life. Once in a while it is fun to give them to special friends who will appreciate them and help keep an old tradition alive. Individual ration or MCI for short. The MRE came sometime after that. (Dog Platoon) at Feucht AAF MOS 19D2-F for Air Scout. interpret) Airdale to Ground Pounder. Helo to take its place. make room for the commander and his cohorts. OH-58 only seats 4. So there I was... somewhere... all alone. drew attention of the locals. up on his bike to see what the helo was there for. Well No helo but poor old me. German and he knew no English. He stuck around for about an hour and then rode off back home I guess. About 2 hours go by and another OH-58 shows up. I'm hoping to drag me out of there. awhile; and maybe overnight. (Oh God No). found a treeline we liked and planted the birds there for the night. nobody knew where we would be. After all we were Cav not Army! loved to get there hands on. And don't forget the Chiclets. It is a couple few hours before sunset so the kids need to head home. I'm a bit concerned until they arrived and the kids jump out. They all left back home just as it was getting dark. Right at dusk turns to dark my OH-58 shows back up with my pilot. the kids would come back the next day and find them. treeline night camp they had picked out. The Platoon hearing the story made sure I got my P-38 replaced. I got about 15 of them. One from each member of Dog. Dear to heart that day was and I will never forget it. HELP ME EDUCATE PEOPLE ABOUT THE ARMY'S GREATEST INVENTION EVER. SEND ME YOUR P-38 STORY, A PHOTO OF YOUR P-38 COLLECTION, AN OLD P-38 OR A WRAPPER AND I WILL PUT IT ON THE WEBPAGE!!! Photo from 'Offerings at The Wall' by Rick Vargas, Montage made from Beer Can, Ravioli, P-38 Can Opener, Flag and Cigarettes left in Remembrance for a friend near the base of the Vietnam Veterans Memorial. There comrades and loved ones leave their poignant tokens of remembrance. Major Lawrence Dobson, Observer for The Quartermaster General. (From an oral report, 25 April 1951.) 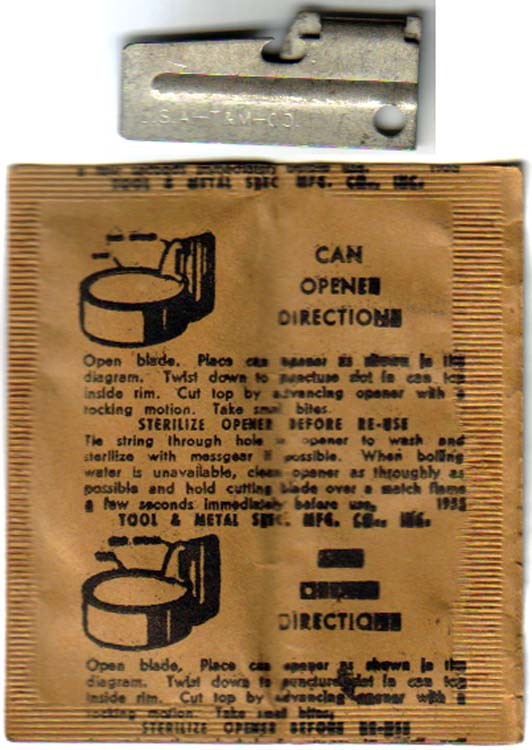 In the past we included a can opener in each accessory packet. 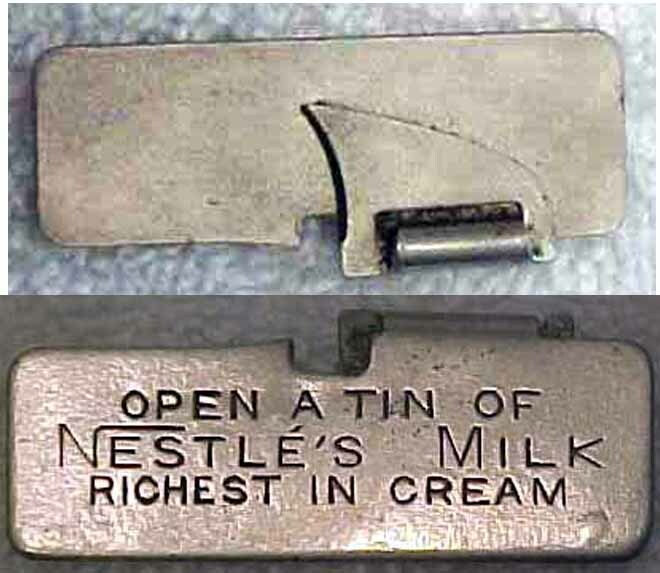 Every soldier I saw had a can opener in his pocket or on his dogtag chain. He was afraid he would not have a can opener when he wanted to eat. If he had a can opener and got hold of another, he saved it. My prize example is a colonel who had one can opener on his dogtag chain and nine in his pack. So my recommendation is that the can openers be reduced to either two or three per case and that they no longer be packed in the accessory pack, but be placed on top. Conservation is the most important aspect in energy use. Conservation is related to efficiency and non-use. If your home is well insulated and does not leak air then you do not need as much energy to heat it. This is efficiency. If your car is a smaller model and well designed it will use less energy. This is efficiency. Making one trip to town to accomplish lots of chores instead of many trips is both efficiency and non-use. 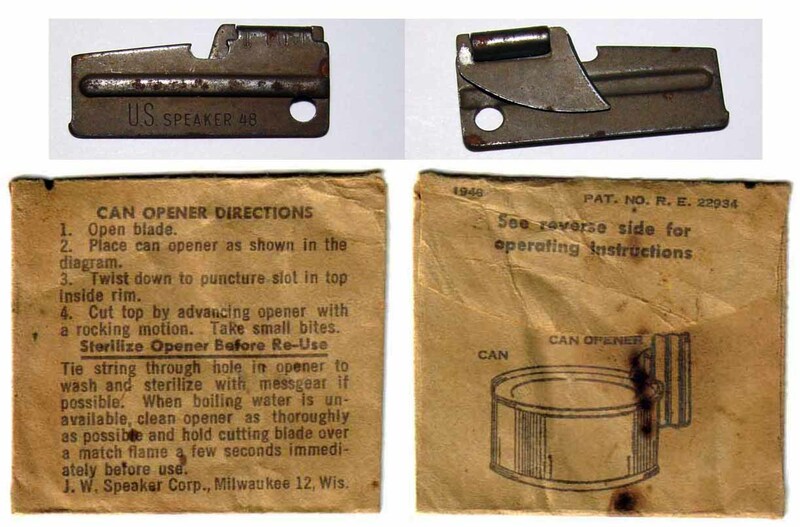 Using a manual can opener (such as the P-38) is a simple example of non-use. The TSA webpage has the following statement that gives the screeners enough leeway to take your treasured P-38 for the common good: The prohibited and permitted items chart is not intended to be all-inclusive and is updated as necessary. To ensure everyone's security, the screener may determine that an item not on this chart is prohibited.